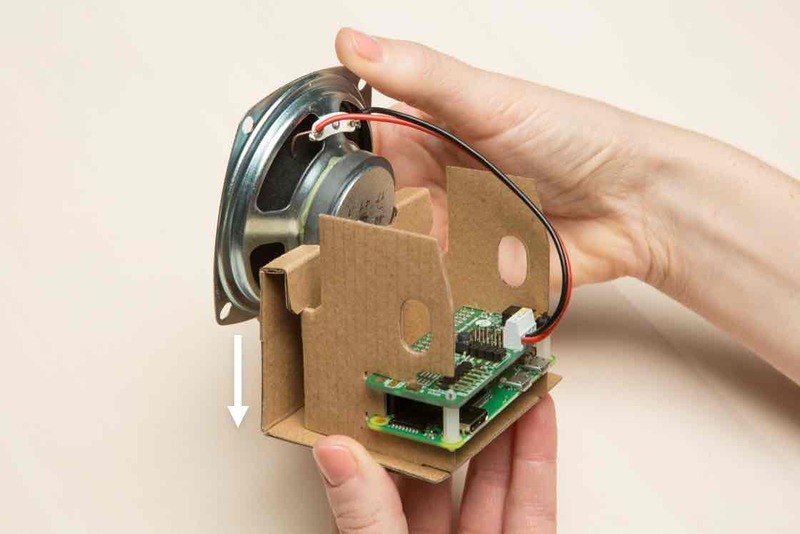 Do-it-yourself intelligent speaker. Experiment with voice recognition and the Google Assistant. 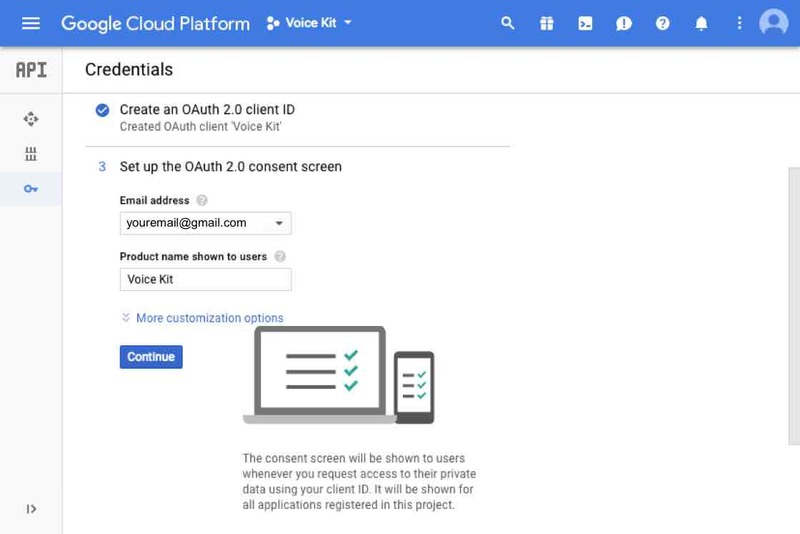 SSH to Your Kit Verify audio works Get Credentials Run the Assistant Demo Reconnecting your Kit What's Next? 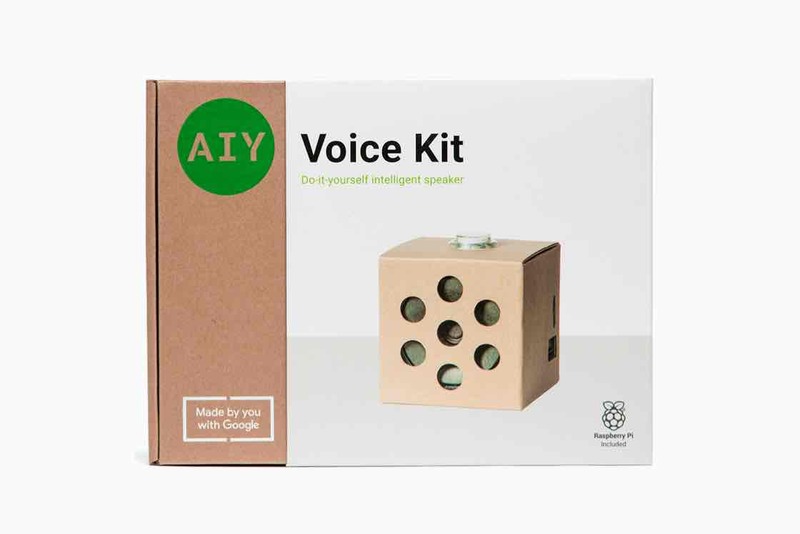 The AIY Voice Kit from Google lets you build your own natural language processor and connect it to the Google Assistant or Cloud Speech-to-Text service, allowing you to ask questions and issue voice commands to your programs. 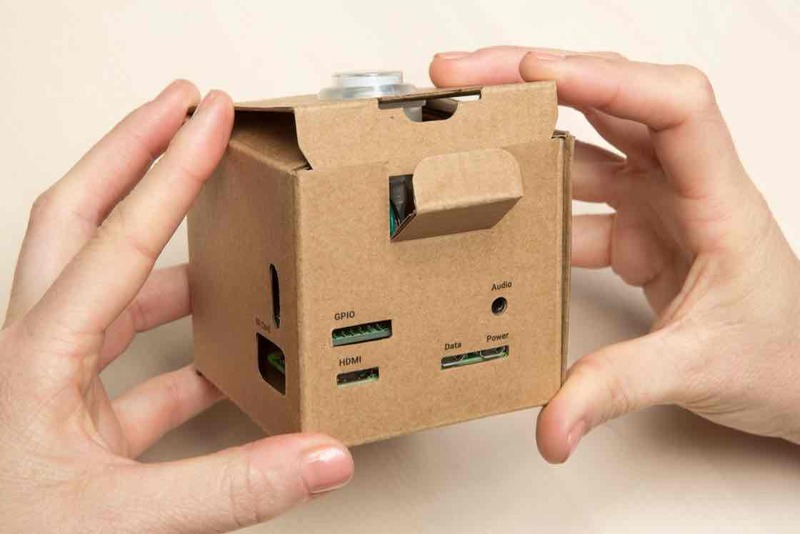 All of this fits in a handy little cardboard cube, powered by a Raspberry Pi. 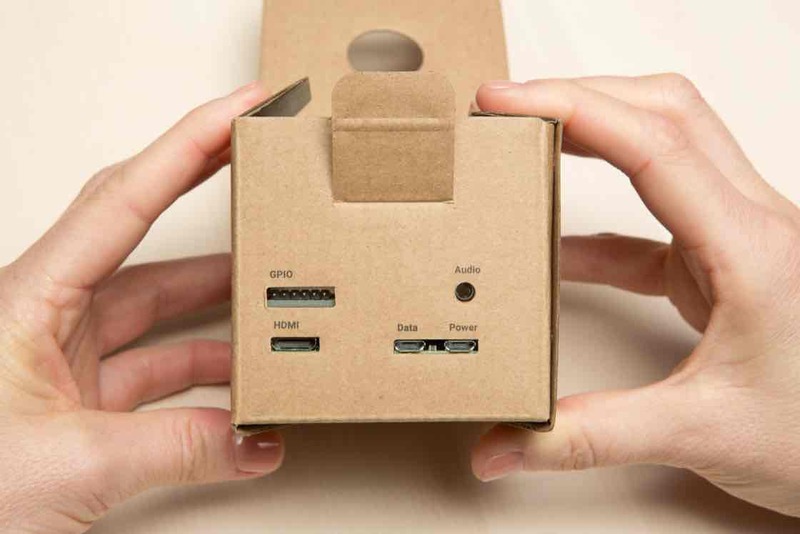 Everything you need is provided in the kit, including the Raspberry Pi. 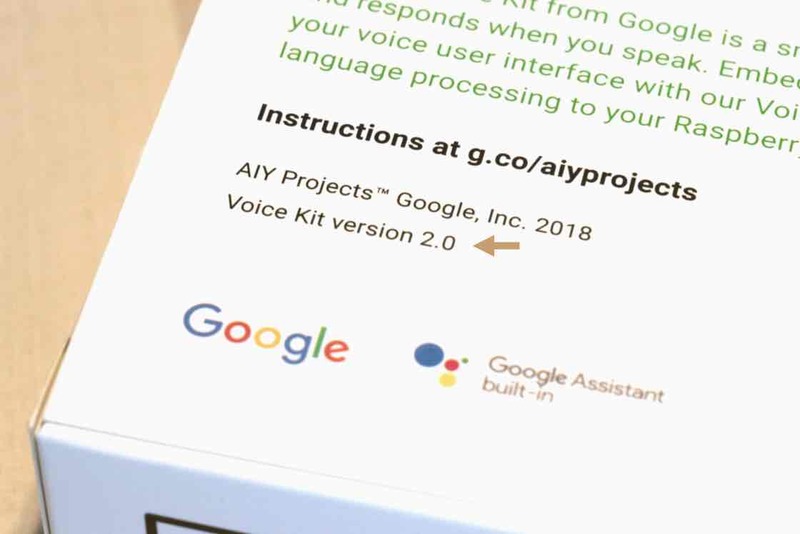 The following instructions show you how to assemble your AIY Voice Kit, connect to it, and run the Google Assistant demo, which turns your kit into a voice assistant that responds to your questions and commands. 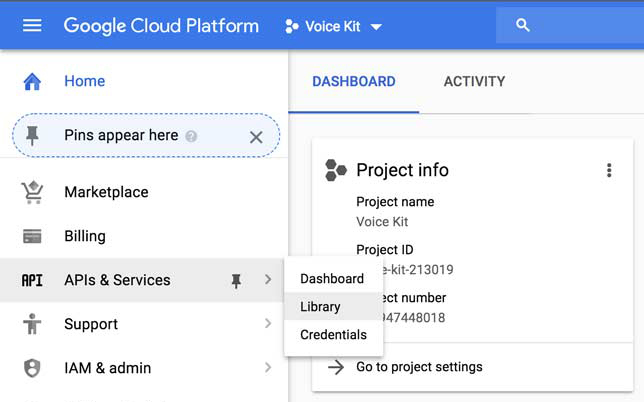 Then you can try some other sample code or use the Google Cloud Speech-to-Text service, which converts spoken commands into text you can use to trigger actions in your code. 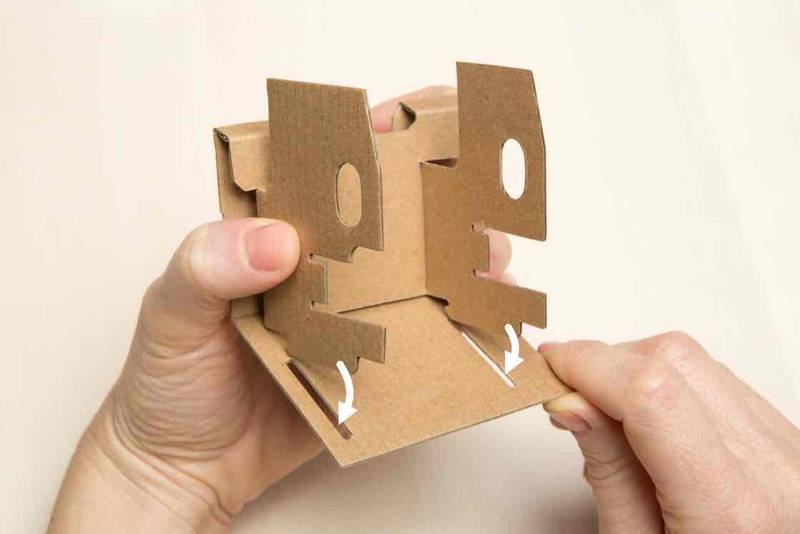 If you have any issues while building the kit, check out our help page or contact us at support-aiyprojects@google.com. These instructions are for Voice Kit 2.0. Check your kit version by looking on the back of the white box sleeve in the bottom-left corner. If it says version 2.0, proceed ahead! If it doesn’t have a version number, follow the assembly instructions for the earlier version. Micro USB power supply: The best option is to use a USB Power supply that can provide 2.1 Amps of power via micro-USB B connector. The second-best choice is to use a phone charger that also provides 2.1A of power (sometimes called a fast charger). Don't try to power your Raspberry Pi from your computer. It will not be able to provide enough power and it may corrupt the SD card, causing boot failures or other errors. Below are two different options to connect to your kit to Wi-Fi, so that you can communicate with it wirelessly. Choose this option if you have access to an Android smartphone and a separate computer. Choose this option if you don’t have access to an Android smartphone. Adapter to attach your mouse and keyboard to the kit. Below are two different options. Adapter option A: USB On-the-go (OTG) adapter cable to convert the Raspberry Pi USB micro port to a normal-sized USB port. You can then use a keyboard/mouse combo that requires only one USB port. 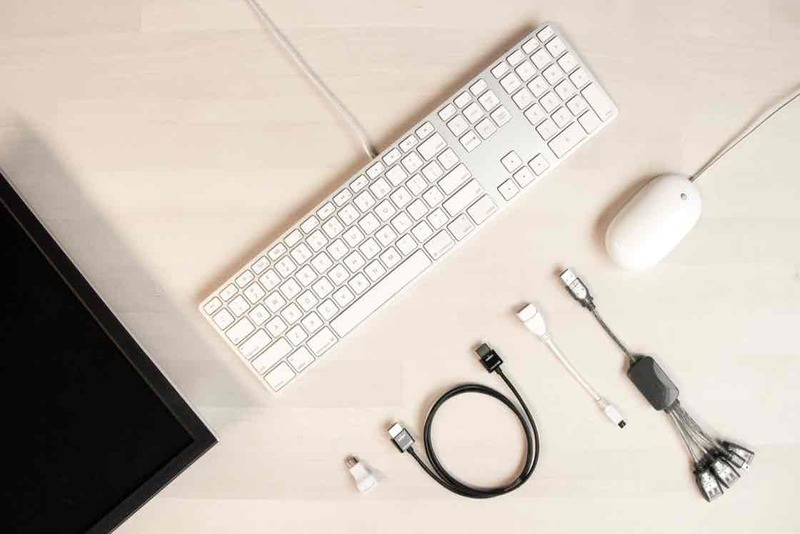 Adapter option B: Micro USB Hub that provides multiple USB ports to connect to any traditional keyboard and mouse. Open your kit and get familiar with what’s inside. Missing something? 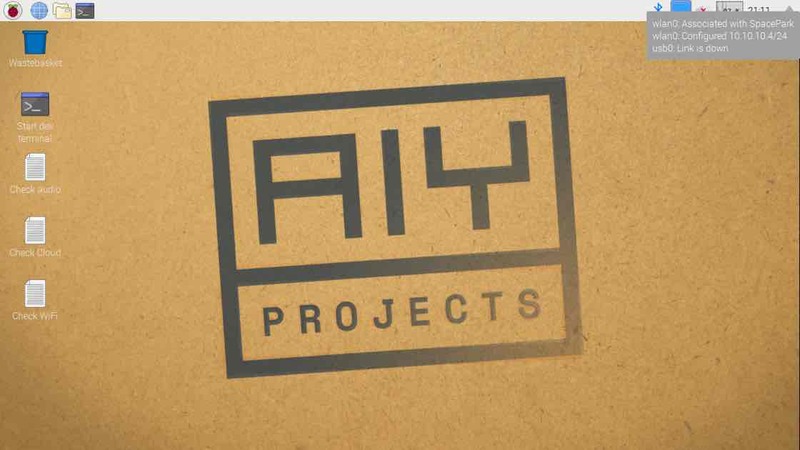 Please send an email to support-aiyprojects@google.com and we will help direct you to finding a replacement. 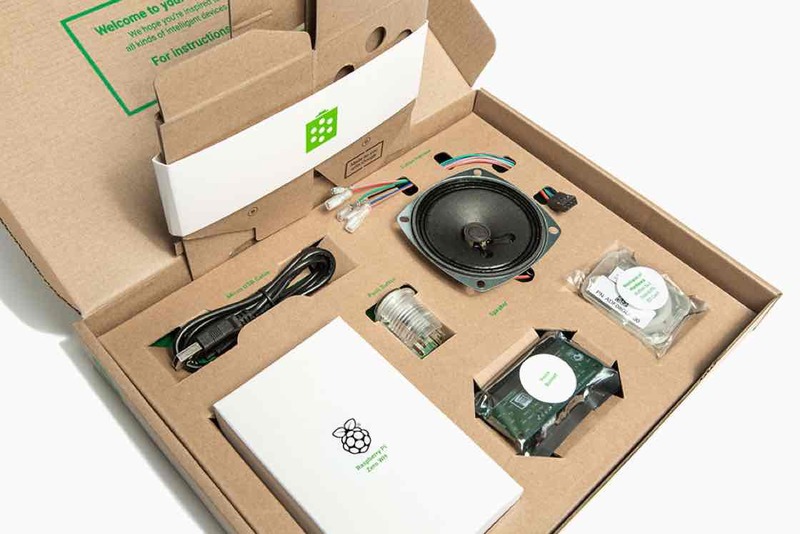 This kit requires a special version of the Raspbian operating system that includes some extra AIY software. Although the MicroSD card included with your kit is pre-flashed with the AIY system image, it's very likely out of date. So before you begin, we highly recommend you download and install the latest system image and flash it to your MicroSD card. Otherwise, you might encounter some old bugs and some of the sample code might not work for you. Download the latest .img.xz file from our releases page on GitHub. Use an adapter to connect your MicroSD card to your computer. Flashing the system image onto the card can take a several minutes. So while that’s going, start assembling the kit. 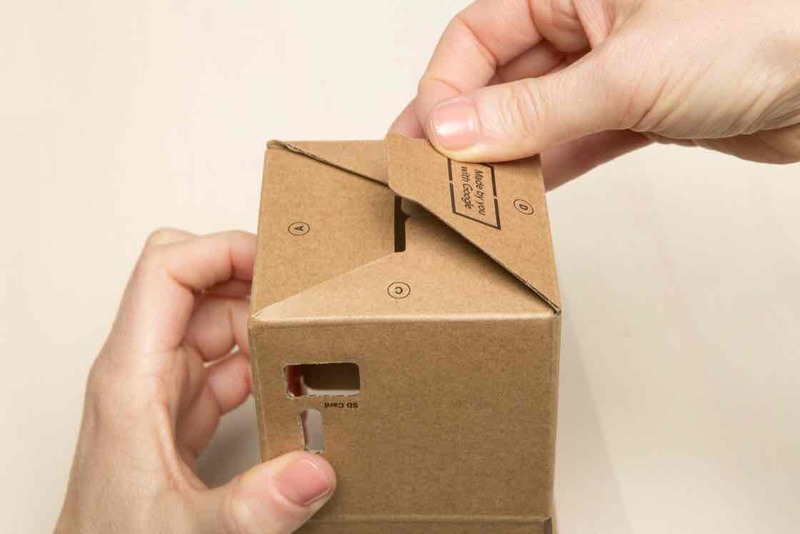 Once the kit is assembled, you'll put the card into it. 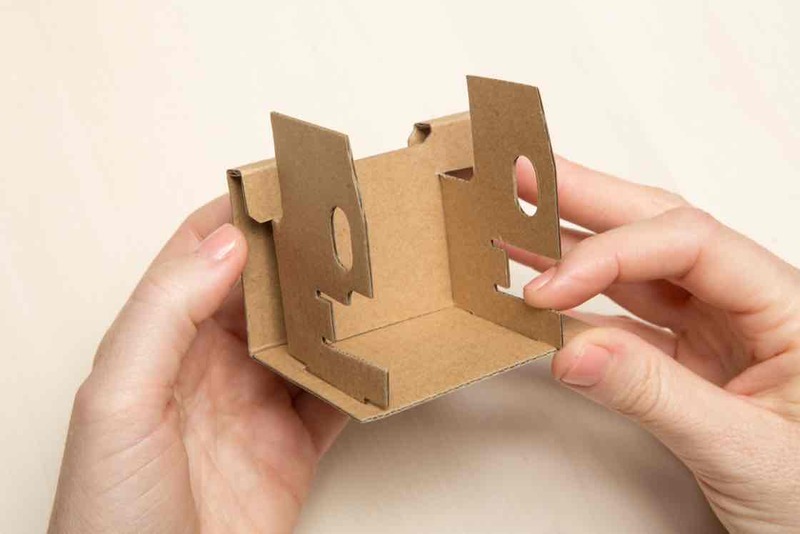 Let’s start by folding the internal frame, which will hold the electrical hardware inside the box. Lay the frame on the table in front of you like the photo. 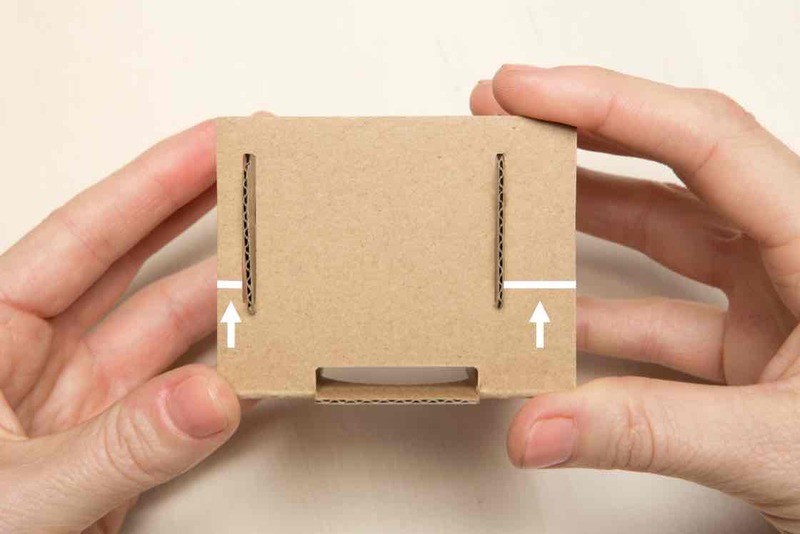 The left slit should be closer to the cardboard edge. Fold the long flap away from you and downwards along the two creases. 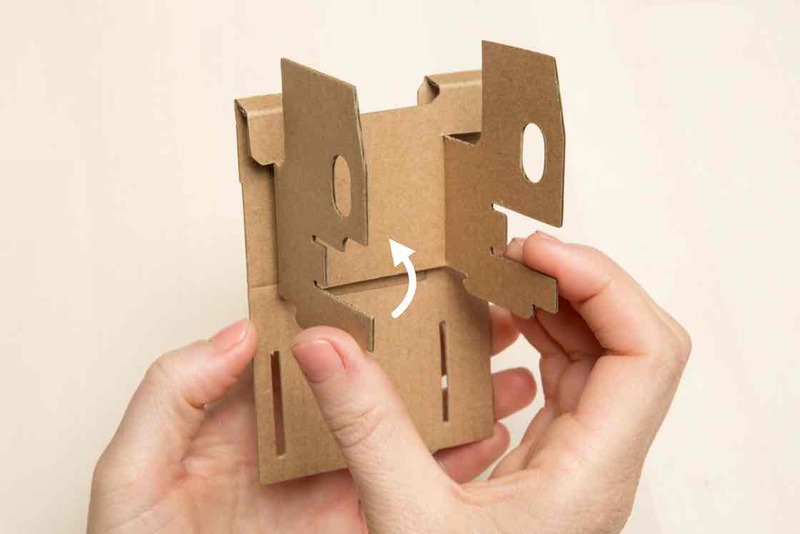 Fold the two highlighted flaps toward you. 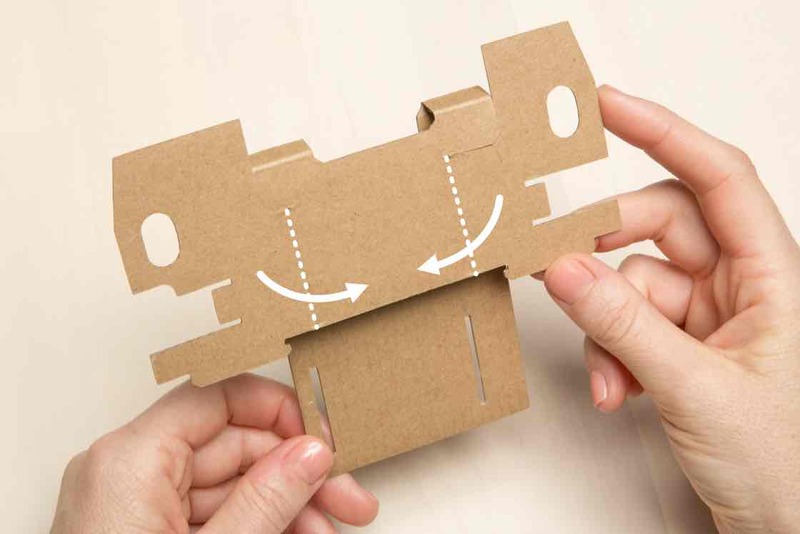 Fold the bottom flap upward toward you. The slits on the bottom flap will align with two notches. Insert the notches into the slits. Look at the bottom of your frame. The slit closer to the edge should be on the left. If yours looks different, you probably folded the frame the wrong way. Unfold it and check step 1 in fold the internal frame. The internal frame is built. Set it aside for now; we’ll need in the next phase. What are these boards for? 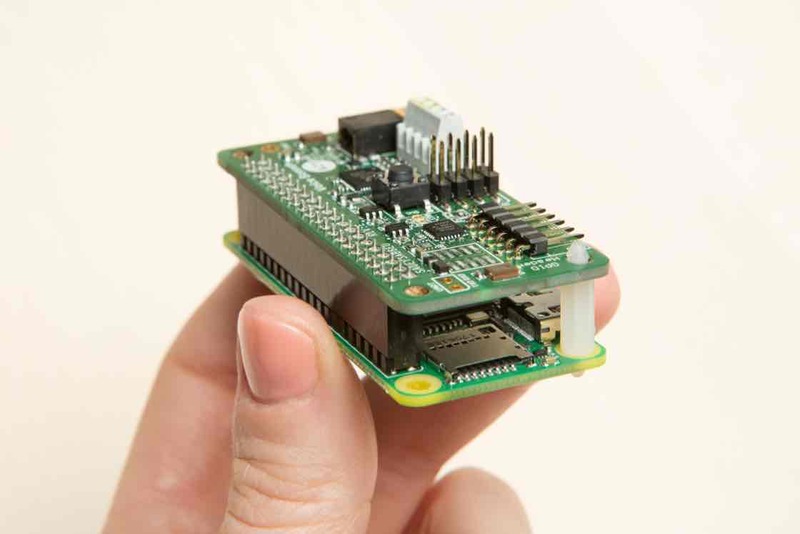 The Raspberry Pi circuit board is small but mighty computer. 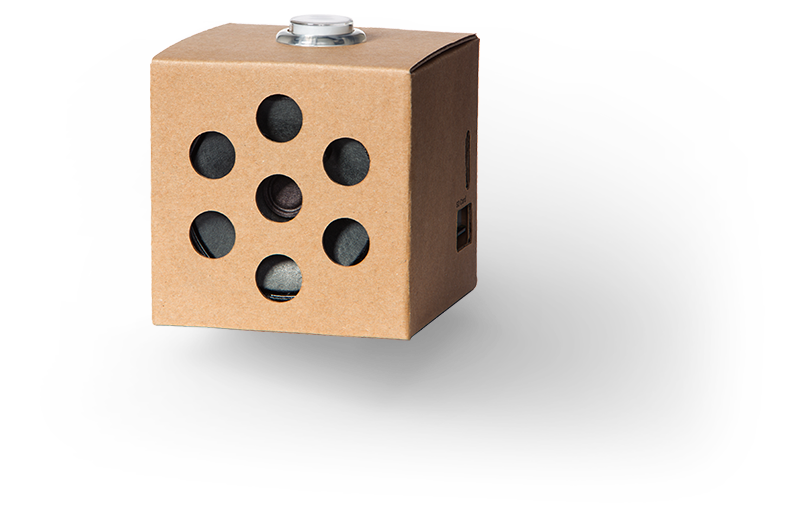 The Voice Bonnet adds 2 microphones, a speaker connector, an LED button connector, and a special audio codec processor. Find your the Raspberry Pi board and orient it so that the 40-pin header is on the left edge of the board, like the photo. 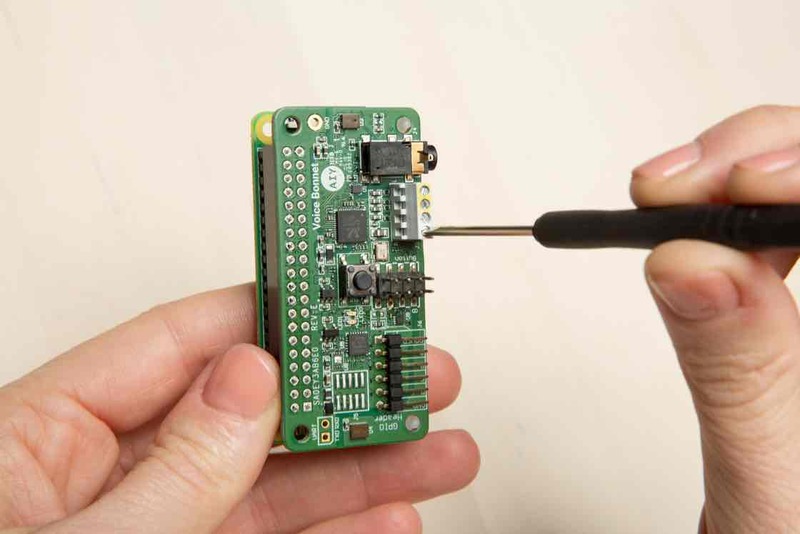 WARNING: First make sure your Raspberry Pi is disconnected from any power source and other components. Failure to do so may result in electric shock, serious injury, death, fire or damage to your board or other components and equipment. Holding the board in your hand, insert the standoffs into the holes on the right edge of the board, opposite the header. It will take a firm push to get the standoffs to click in, so you should support the board from underneath so it doesn’t bend too much. It’s always best to hold the board by the edges (not by the top and bottom surfaces). Grab your Voice Bonnet board. It has a header connector on the bottom of the board. 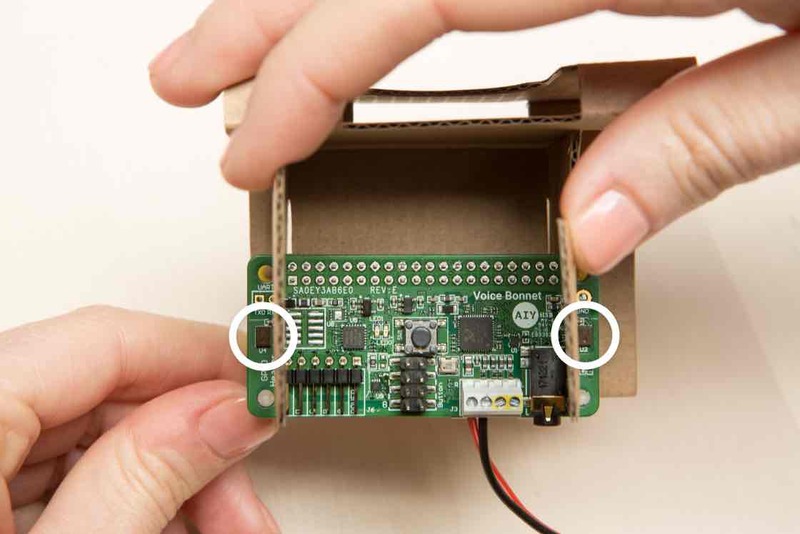 Align the header connector with the pin header on the Raspberry Pi, then press down to connect the headers. Firmly push on the other side of the Voice Bonnet to snap the standoffs into place. Push near the standoffs, not in the center of the board. Make sure the standoffs have snapped into the boards and that the 40-pin header is pushed all the way down so that there is no gap between the two boards. WARNING: Failure to securely seat the Voice Bonnet may cause electric shock, short, or start a fire, and lead to serious injury, death, or damage to property. Grab your 2mm screwdriver and loosen the two bottom screws of the screw terminal so that you can insert the speaker wires. Take your speaker and find the red and black wires attached to it. Insert the red wire into the bottom slot of the left-most terminal and gently push it in as far as you can. Do the same for the black wire in the second terminal from the left. What are the speaker wires for? The red and black wires transmit electrical signals which are converted to sound by the speaker. Secure the wires by using your 2mm screwdriver to turn the screws clockwise. WARNING: Failure to secure the wires or leaving wires exposed may cause electric shock, short, or start a fire, and lead to serious injury, death, or damage to property. Now that your speaker is connected to the terminals, we can put the boards into the internal frame. The microphones on the left and right edges of the board (circled in white) should be outside the internal frame. Slide the speaker down into the internal frame. WARNING: The speaker contains magnets and should be kept out of reach of children and may interfere with medical implants and pacemakers. Make sure the speaker is snug and secure. 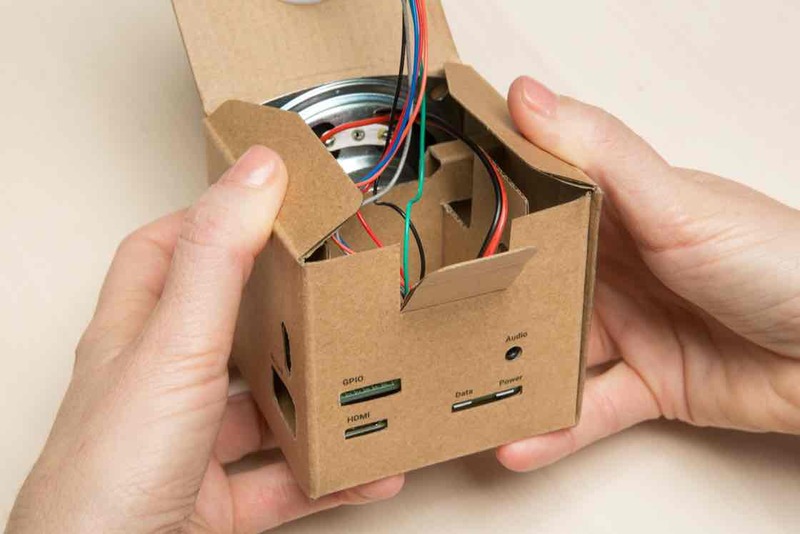 Now that your electrical hardware is secure on the cardboard frame, let’s build the box it goes into. 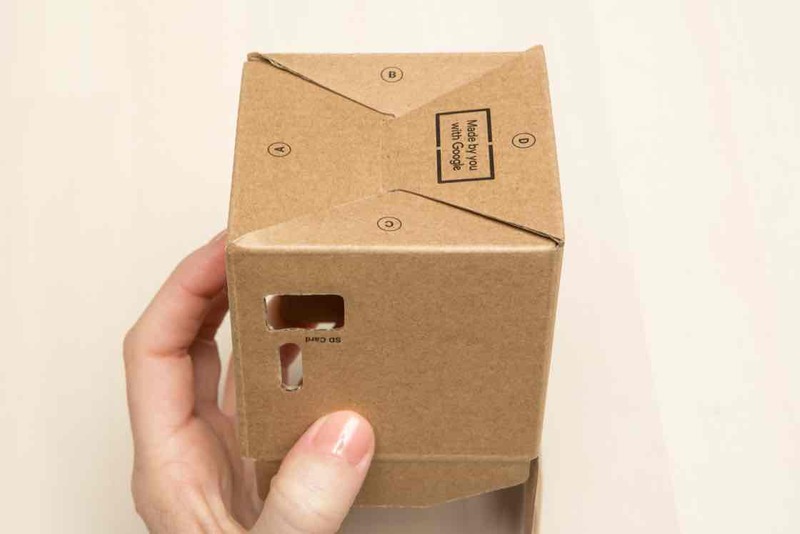 Find the speaker box cardboard and pop it open by squeezing along the edges of the box. Fold flap A down into the box. 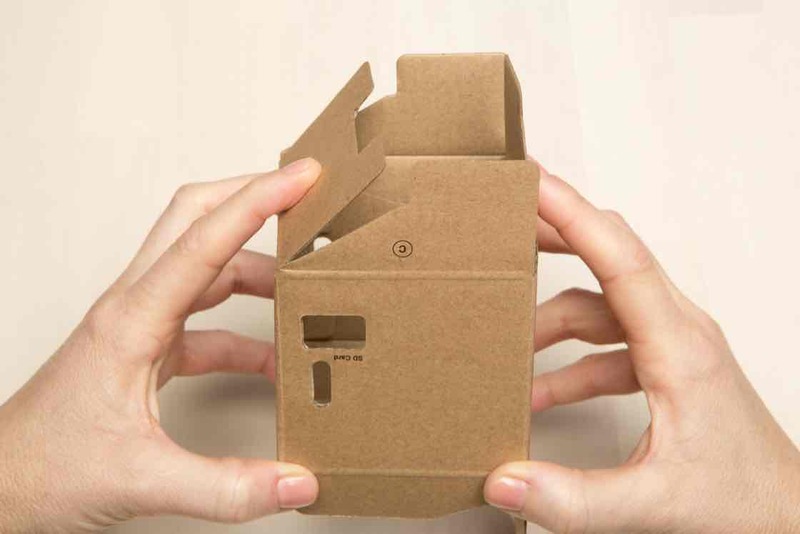 Then fold flaps B and C down into the box. Lastly, fold flap D down, pressing until it locks into place. The bottom should be secure. In the next step we’ll bring it all together. Slide the internal frame into the speaker box. 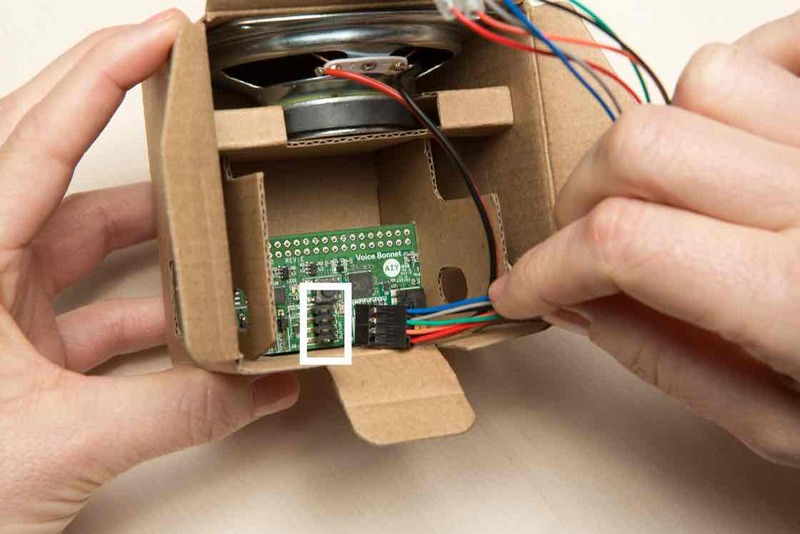 Make sure the speaker is lined up with the side of the cardboard box that has circular holes. Once it’s in, check the sides of the internal frame. There should be more space between the internal frame and the right side of the speaker box. Yours looks different? 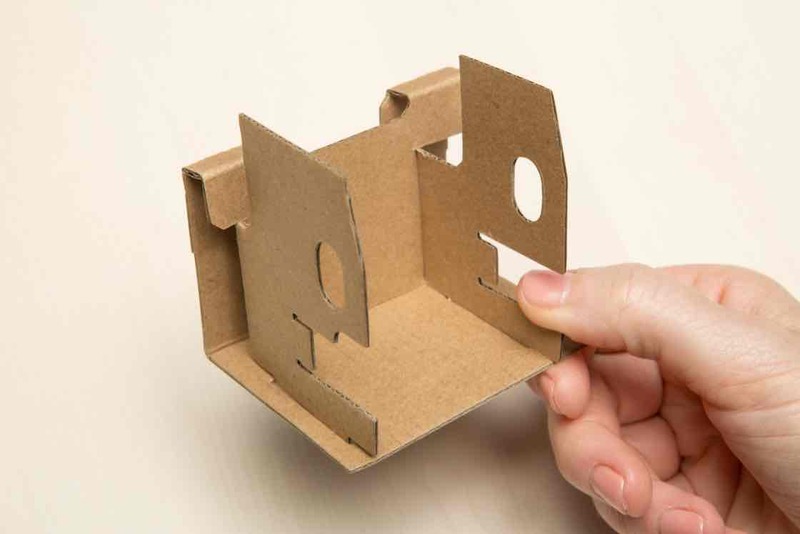 If the inside of your box looks different, you might need to fold the internal frame the other way. Check step 7 in fold the internal frame for more help. 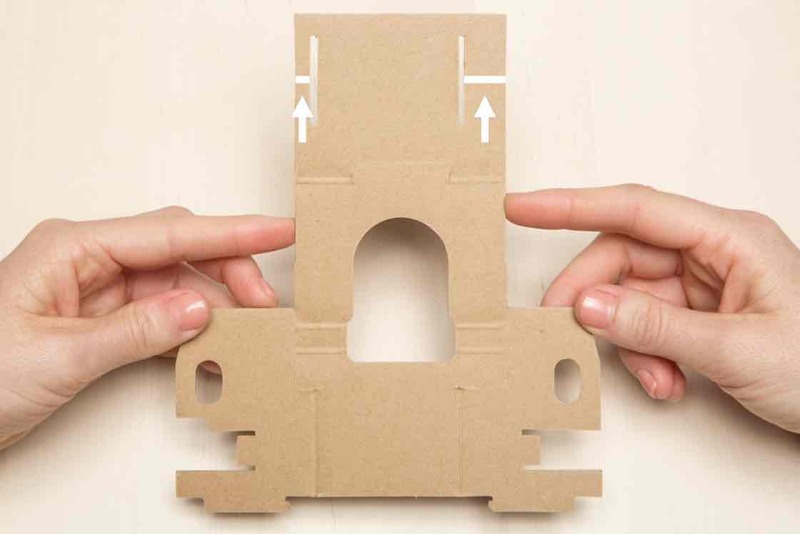 Make sure the connectors are lined up with the cardboard cutouts. The connectors are used to plug in things like your SD card and power. WARNING: Forcing connectors into misaligned ports may result in loose or detached connectors. Loose wires in the box can cause electric shock, shorts, or start a fire, which can lead to serious injury, death or damage to property. Yours looks different? If your connectors don’t line up, you may have inserted the internal frame the wrong way. Check step 26 in put it all in the box for more help. 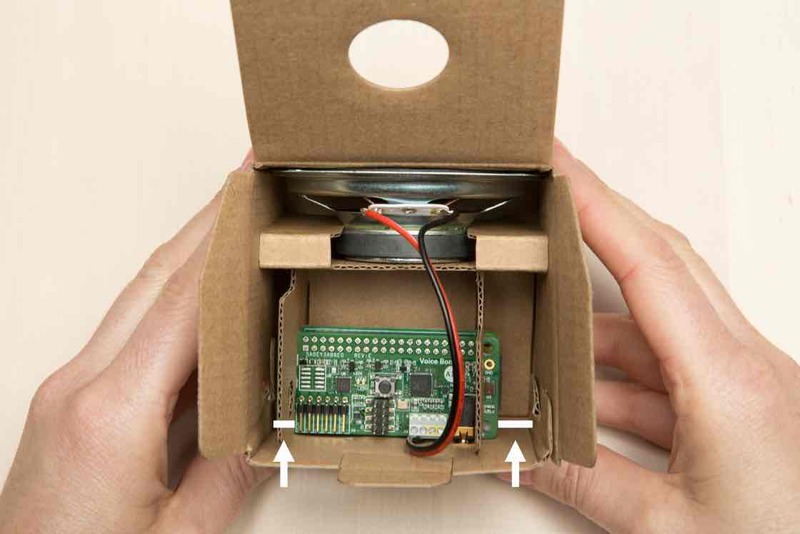 Insert the push button into the hole on the top of your cardboard box. On the other side, orient the button so that the side with four prongs is on the top (check the photo). Screw on the button nut to secure the button in place. 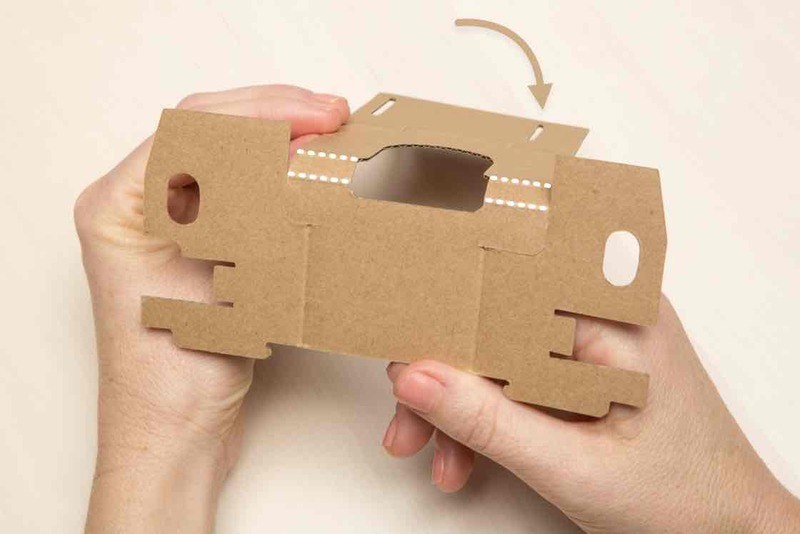 Make sure the wider, flanged side of the nut is facing the cardboard flap. Make sure your button is still oriented so the four prongs are on top. Now it’s time to plug in the wires on the button harness. 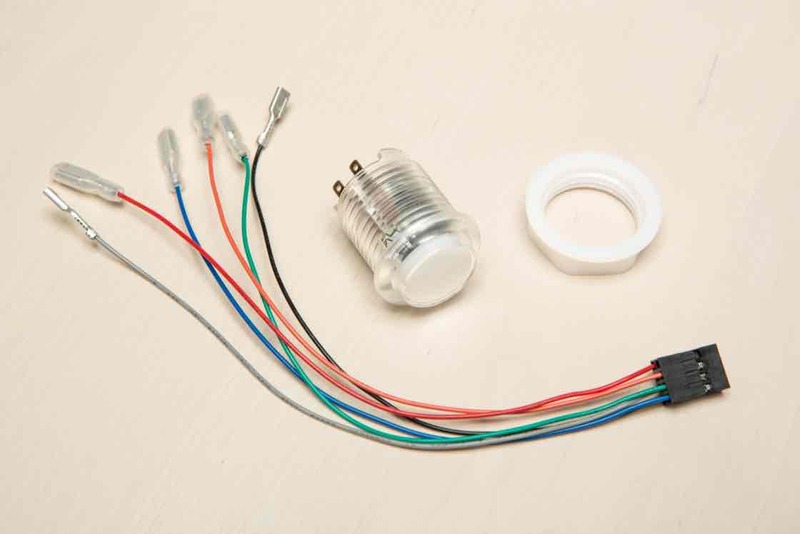 Take the button harness and find the end with six individually colored wires. 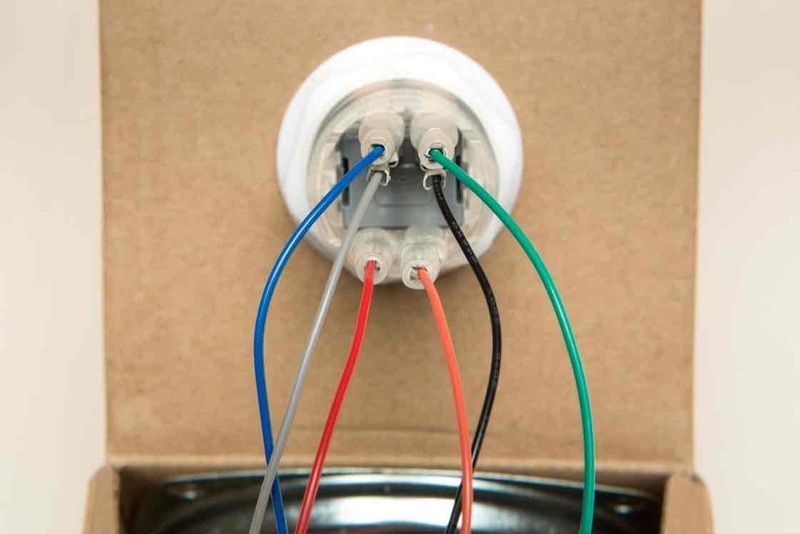 Plug each of those wires in the correct slot by matching its color to the image. Double-check to make sure your wires are plugged in the same way as the image. 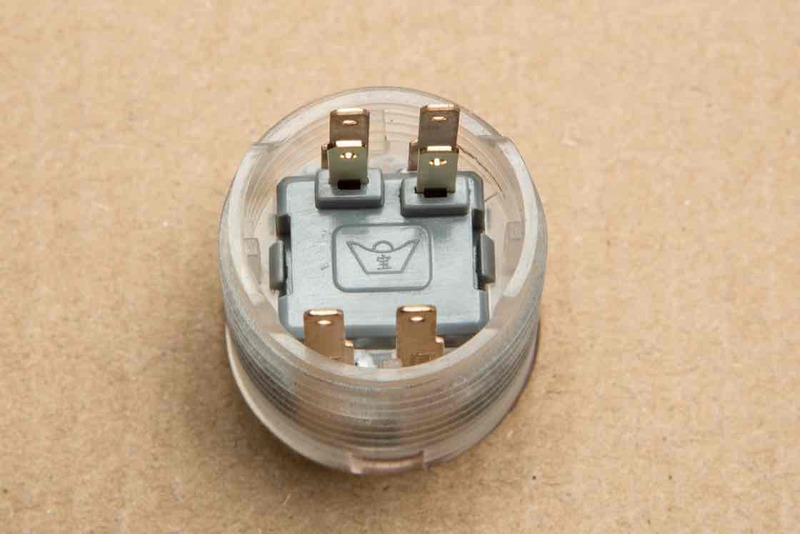 To plug in the button harness, first find the 8-pin connector on your Voice Bonnet board, outlined in a white rectangle in the photo. With the speaker facing away from you, plug the black wire into the top-right slot. Plug the blue wire into the top-left slot. Double check to make sure this is correct. WARNING: Failure to securely seat the connector may cause electric shock, short, or start a fire, and lead to serious injury, death, or damage to property. 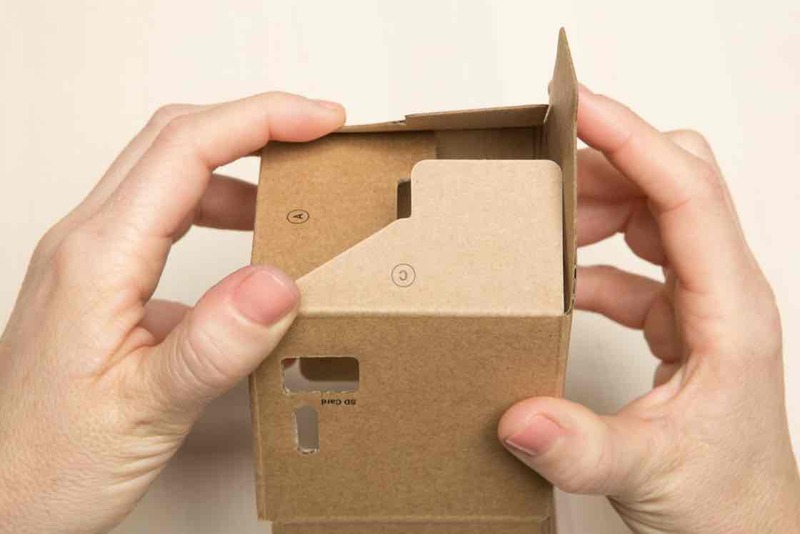 Close your box by folding down the top flaps. Secure the box by tucking in the tab. The SD card is pre-loaded with all the software you need. 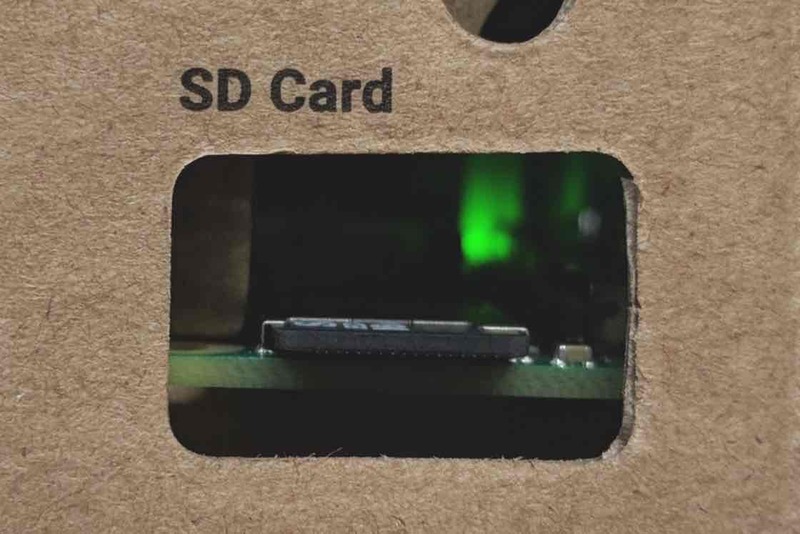 With the arrow side facing up, insert your SD card into the silver slot on the Raspberry Pi, which you can find through the cardboard cutout labeled SD Card. Congrats, you’ve just assembled the Voice Kit hardware! 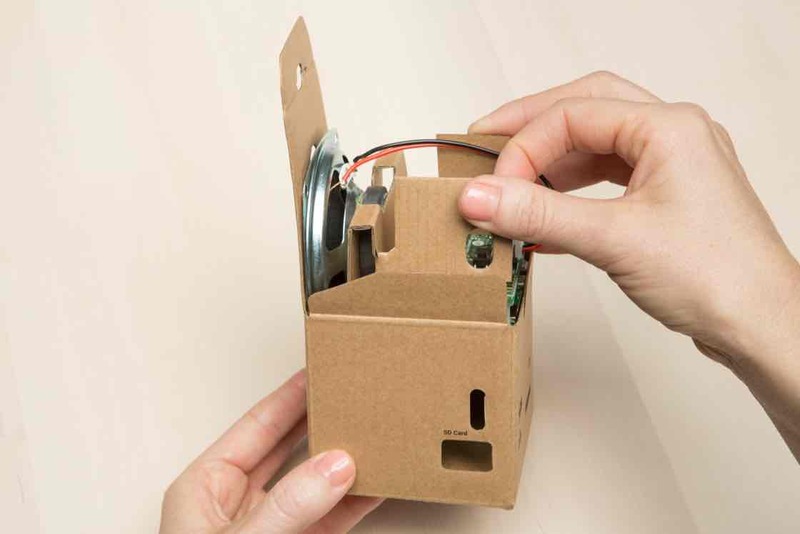 Now you’re ready to connect your kit to the Google Assistant. How did assembling your Voice Kit hardware go? There are two ways to connect your kit to Wi-Fi and get an IP AddressThe Internet Protocol Address is a four-segment number that identifies a device on a network. Every device on your network - your computer, phone, your Voice Kit - will have a unique IP Address. Using this address, one device can talk to another., depending on what you have available. There are two options for connecting, explained in Meet your kit. 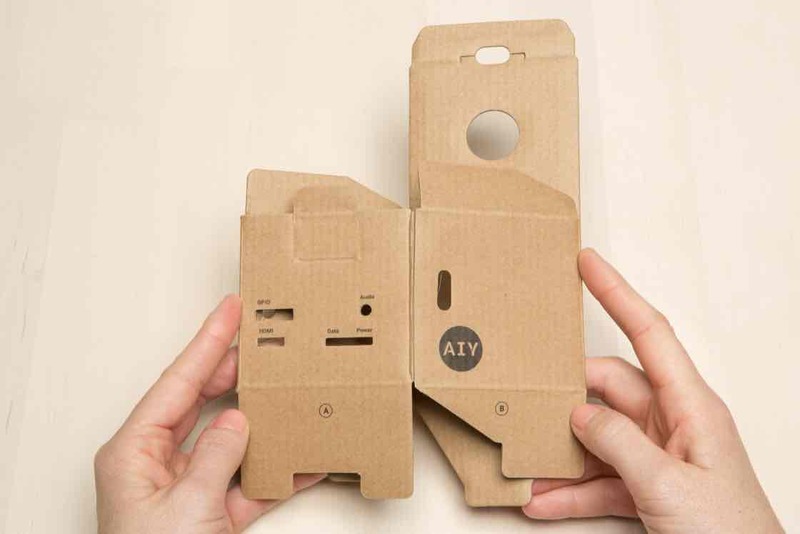 Follow instructions for one connection option, either with the AIY Projects app or with a monitor, mouse, and keyboard. Plug your Voice Kit into your power supply through the port labeled Power. See Meet your kit for power supply options. Do not plug your Voice Kit into a computer for power. To confirm that it’s connected to power, look into the hole in the cardboard labeled SD Card. You’ll see a green LED flashing on the Raspberry Pi board. Wait about four minutes to allow your device to boot. You’ll know when it’s booted when the LED light stops flashing and remains lit. 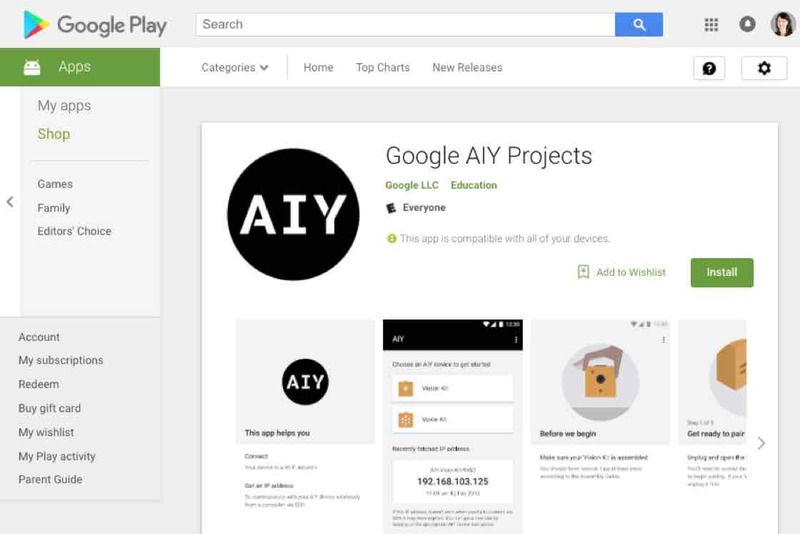 From your Android device, go to the Google Play Store and download the AIY Projects app. This app will allow you to connect your Voice Kit to a Wi-Fi network, and display an IP address to communicate with your Voice Kit wirelessly via a separate computer and SSH. Open the app and follow the onscreen instructions to pair with your Voice Kit. Take note of the IP address — you’ll need it later. The app will also remember and display it on the home screen. Move to the next section, Log in to your kit. Not working? Make sure your Voice Kit is still connected to a power supply. If you run into errors, quit the app and try again. If the device won’t pair, make sure the green LED on the Voice Bonnet is flashing. If it’s not flashing, it may have timed out. Press and hold the Voice Bonnet button for 5 seconds, and try again. If that doesn’t work, try restarting your phone. How did it go connecting your Voice Kit to Wi-Fi and getting an IP address? Use connection option if you don’t have access to a second computer and Android smartphone, or if you prefer to connect directly to your Raspberry Pi. 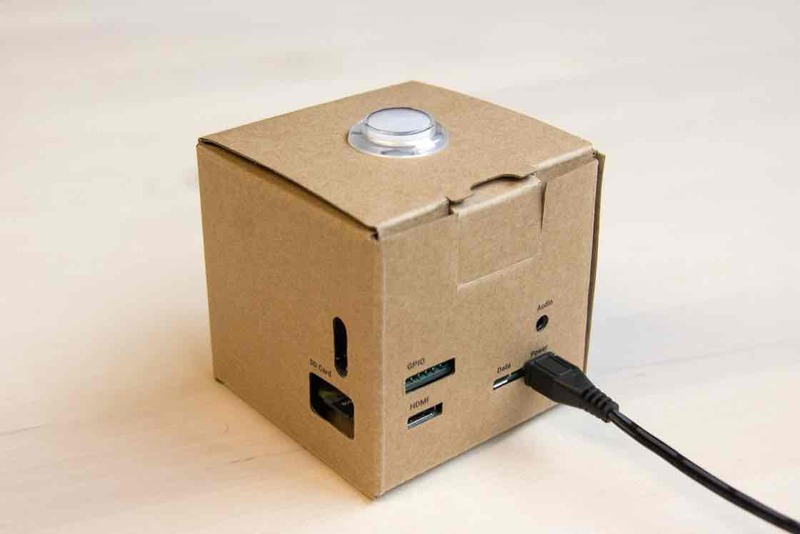 You’ll need a set of peripherals to interact with your Raspberry Pi, including a monitor, keyboard and mouse. Check here for suggestions. Before plugging into power, plug in your monitor into the HDMI port and your keyboard and mouse into the port labeled Data on your Voice Kit using one of the adapters described in Meet your kit. 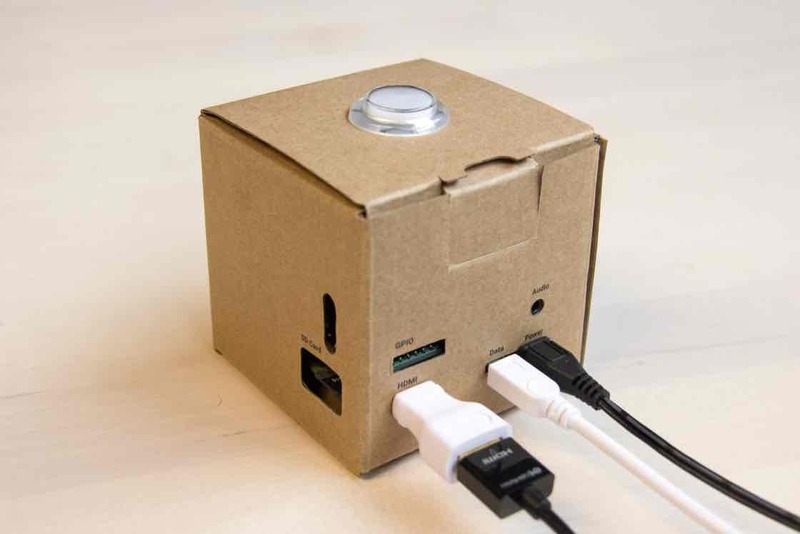 Connect your power supply to the Raspberry Pi. To confirm that it’s connected to power, look into the hole in the cardboard labeled SD Card. You’ll see a green LED flashing on the Raspberry Pi board. When you plug it in, you’ll see the Raspberry Pi logo in the top left corner of the screen. You’ll see a desktop with the AIY logo on the background. 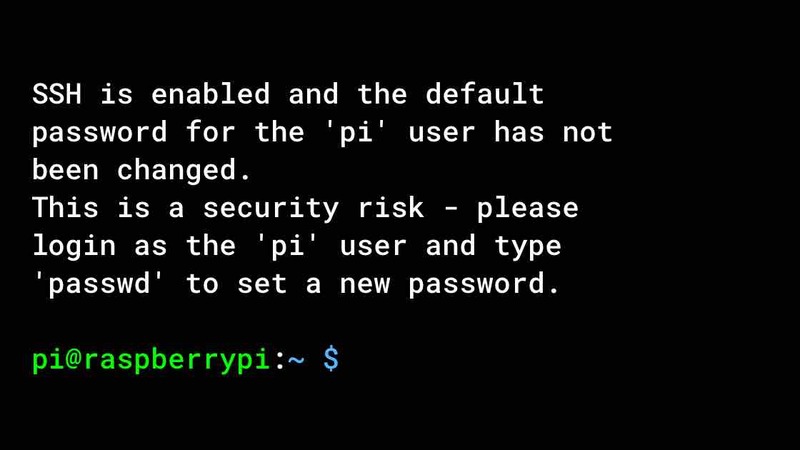 A warning pop-up will tell you the password for the Raspberry Pi user is set to the default. This is important if you plan to use this kit in other projects or expose it to the internet, but for now, it's safe to click OK.
Do I need to change my password? 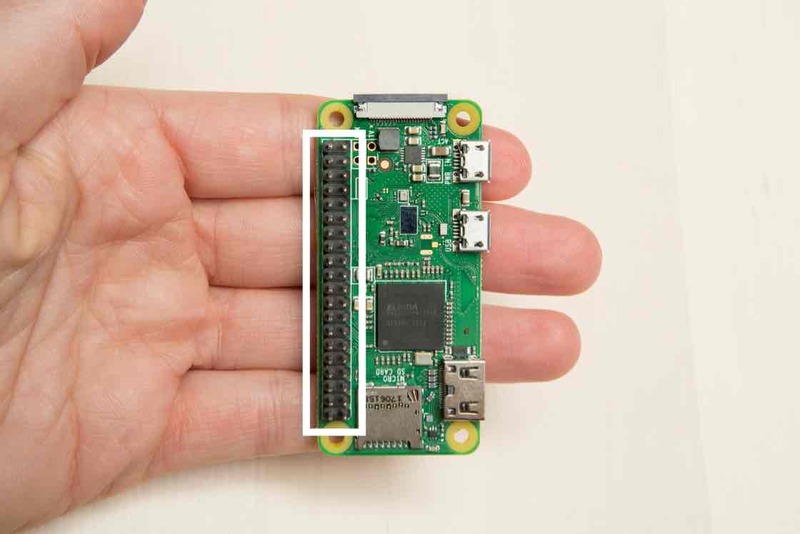 You'll want to change the Raspberry Pi user's password if you plan on using this kit in a project that is exposed to the open internet. It's not safe to expose it with a password everybody knows. If you plan on doing this, you'll want to use the passwd program. 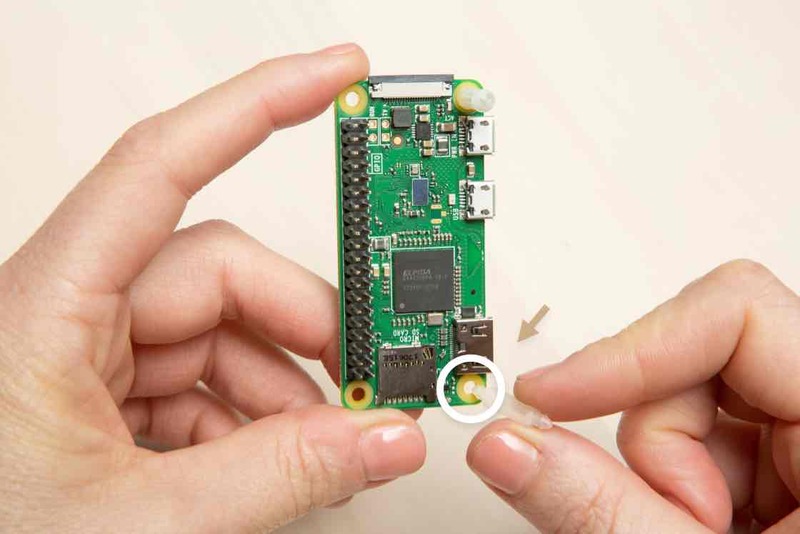 This is an advanced step, so for the purposes of this guide, we will assume you haven't changed the password for the Raspberry Pi user. Note If you do change the password, make sure you keep your password written down somewhere safe in case you forget. It's not easy to recover it if you change it. Using your mouse, click on the Wi-Fi connection icon at the bar at the top right of the screen. Look for your Wi-Fi network name (also known as an SSID) and click on it. If you have a password, a dialog will appear asking for the pre-shared keyThis is just a fancy way of saying password and is borrowed from the Wi-Fi security standards. Pre-shared just means the password was given to you before you attempted to connect.. Enter your password here and click OK.
Watch the Wi-Fi icon you just clicked on to bring up the menu. It should begin flashing. Once it's gone solid, you are connected. You'll need to know the Raspberry Pi’s IP address so you can SSH to it from your computer in steps below. You can find it by hovering over the Wi-Fi icon. 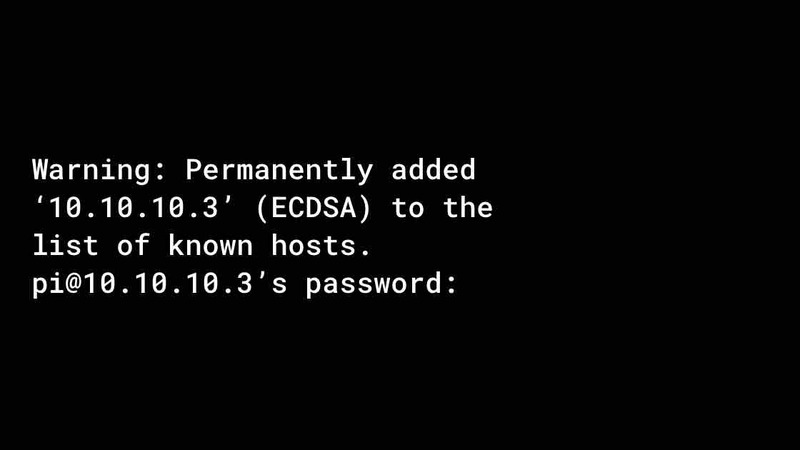 It will look something like 192.168.0.0 or 10.0.0.0 and prefixed with wlan0Linux uses acronyms like wlan0 as names for network devices connected to your computer. In this case, the wlan part stands for Wireless Local Area Network and the 0 means it's the first device Linux identified. In this case, we want the IP address assigned to the wlan0 device, which is why we looked for it in the tooltip. Write down the IP address for now. Make sure your computer is on the same Wi-Fi network as the kit. Now we’re going to connect to your kit through SSHSSH stands for secure shell. It’s a way to securely connect from one computer to another. and set things up so it can talk to the Google Assistant in the cloud. 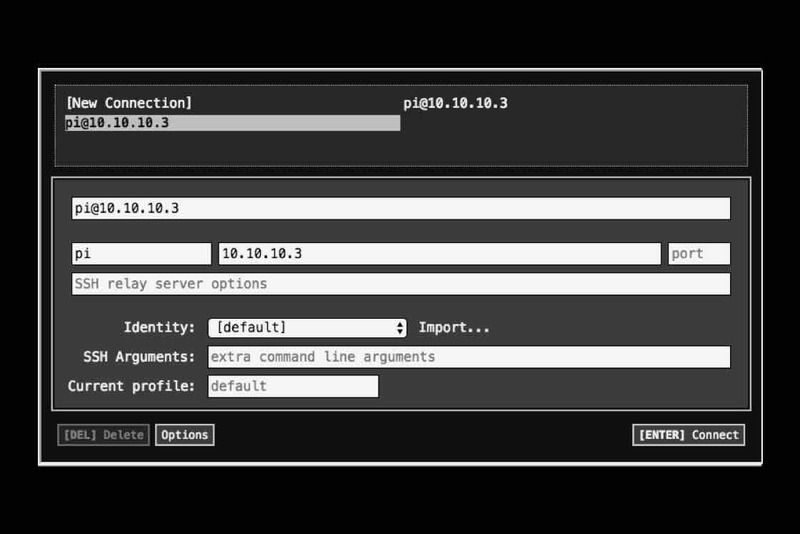 We’re going to connect your computer to the Raspberry Pi using SSH in a terminalA terminal is a text window where you can issue commands to your Raspberry Pi. SSH allows you to do so from a separate computer.. 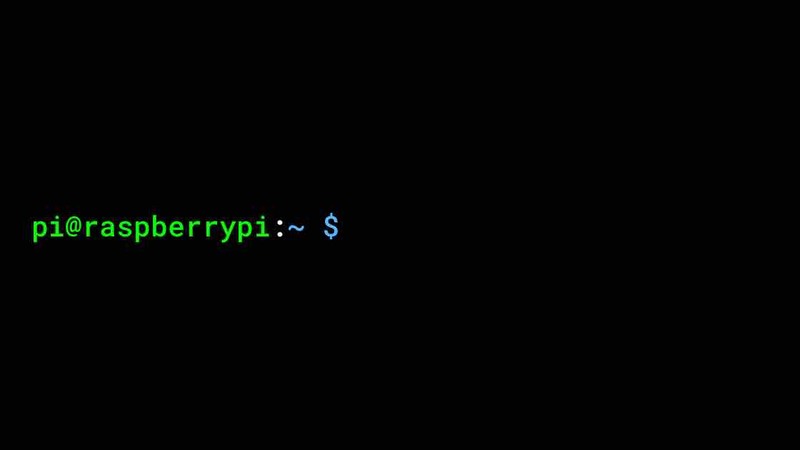 If you’re familiar with using a terminal, start an SSH session with pi@192.168.0.0 (but using your Raspberry Pi's real IP address from above), then skip to step 7. If you're not familiar with a terminal, download and install the Chrome browser and Secure Shell Extension, and proceed to the next step. Once the extension is installed, open it. If you’re using Chrome on a Windows, Mac, or Linux computer, you should see the Secure Shell Extension icon in the toolbar (look to the right of the address bar). Click that icon and then select Connection Dialog in the menu that appears. If you’re using Chrome on a Chromebook, go to the app menu and type "secure shell app extension". In the top field, type pi@192.168.0.0, but replacing those numbers with the real IP address of your Raspberry Pi. After typing this in, click on the port field. The [ENTER] Connect button should light up. Click [ENTER] Connect to continue. Can’t connect? If you can’t connect, check to make sure the IP address you wrote down earlier is correct and that your Raspberry Pi is connected to the same Wi-Fi access point your computer is. Note If you rewrite or replace your SD card, you will need to remove and add the Secure Shell Extension from Chrome. You can do this by right clicking on the icon in your toolbar and selecting Remove, then re-add it by following the instructions above. This gives permission to the SSH extension to access remote computers like your Raspberry Pi. You will only need to do this when you add the extension into Chrome. At this point, the SSH extension has connected to your Raspberry Pi and is asking you to verify that the host keyThe SSH extension is designed to be secure, and because of this goal, it needs to identify that the computer you're trying to connect to is actually the computer you expect. To make this job easier, the computers generate a long number and present it to the extension for verification each time. The extension saves this key somewhere safe so that it can verify that the computer you're speaking to is actually the right one. it printed out matches what is stored on the Raspberry Pi. Since this is the first time your Raspberry Pi has been turned on, the data listed above this prompt is brand new, and it's safe to continue. 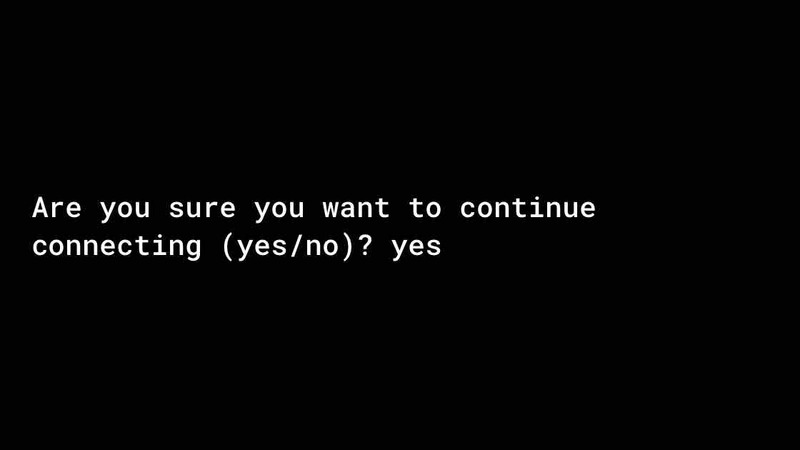 When you answer yes here, the SSH extension will save this information to your browser and verify it is correct every time you reconnect to your Raspberry Pi. At the prompt, type yes and press enter to continue. When you type, you won’t see the characters. If it’s typed wrong, you’ll see “Permission denied, please try again” or “connection closed.” You’ll need to re-start your connection by selecting the (R) option by pressing the R key. Note Your IP address will be different than the one shown in the example. It’s okay if you see the warning line. It’s letting you know that the host key has been saved, and the extension will do the hard work of comparing what it just stored with what the Raspberry Pi provides automatically next time. 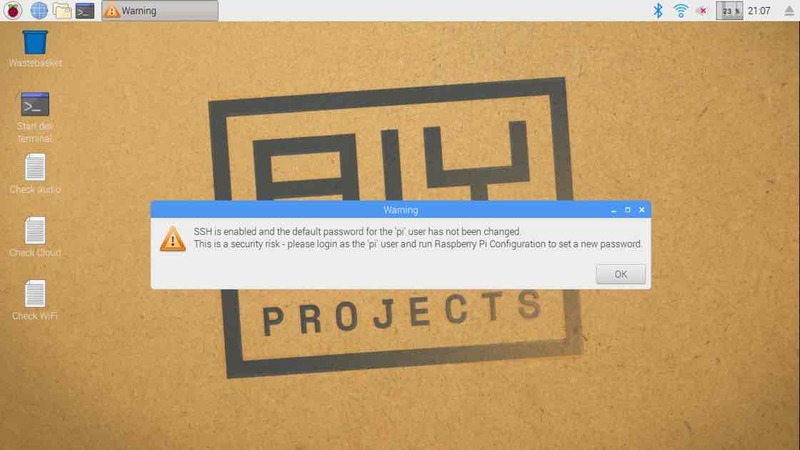 If the password was entered correctly, you’ll see a message about SSH being enabled by default and the pi@raspberrypi shellA shell is a program that runs on a computer that waits for instructions from you, and helps you to make your computer work for you. promptIt’s a response from the shell that indicates that it is ready to receive commands, and tells you what your current working directory is (the tilde, ~, in this case). It ends in a $ where you type your command. will be green. Congrats! 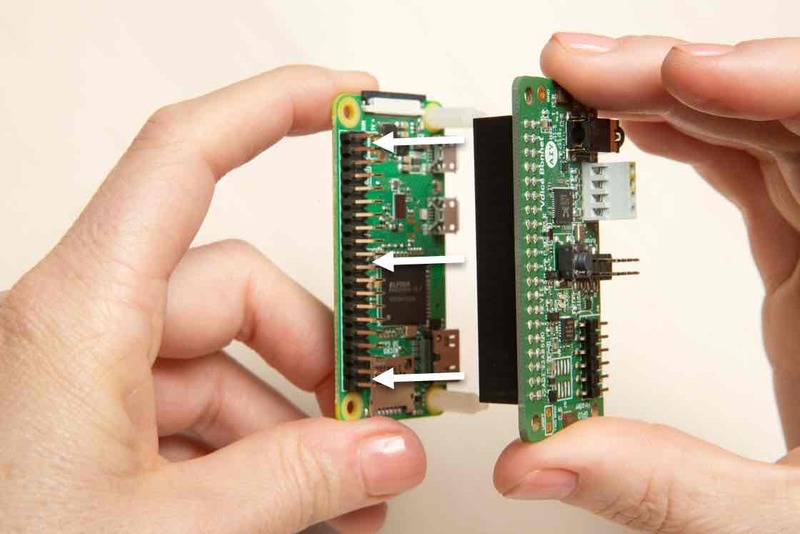 Your computer is now connected to the Raspberry Pi. What is the ~ in the prompt? ~ is just shorthand for /home/pi. When you start the script, it will run through each step listed below. Note: some of the steps require voice input, which you will be prompted for—so watch closely! 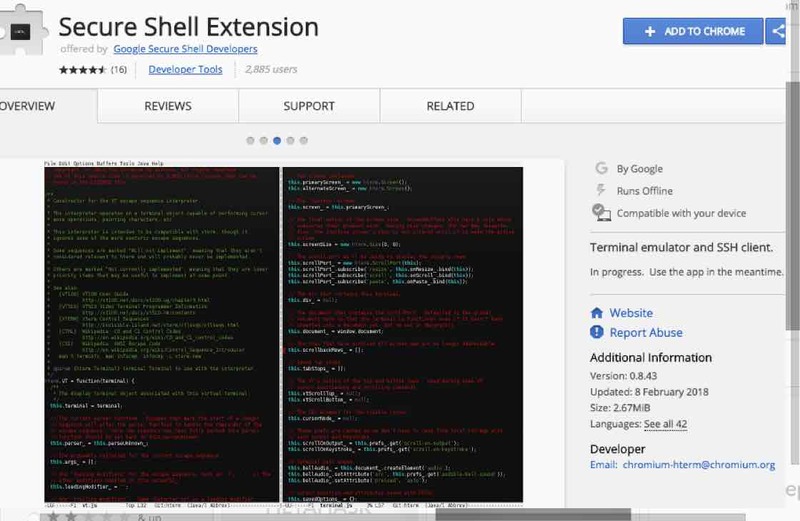 Copy paste in Secure Shell ExtensionCopying and pasting in the Secure Shell Extension is a little different than other applications you may be used to. To copy some text, highlight what you want by clicking and dragging with the left mouse button, and as soon as you let go of it, it'll copy it. To paste, click the right mouse button. On a touchpad this can be a little tricky, so try tapping or pressing in the lower right of the touchpad, or tapping with two fingers. If you see an error message, follow the message details to resolve the issue and try again. This starts the volume control program, as shown in the picture to the left. Use the up and down arrows on your keyboard to adjust the volume. Press the Esc key to exit the program. Quick tip Press the up arrow key at the prompt to scroll through a history of commands you've run. You can edit the command if needed, then press Enter. 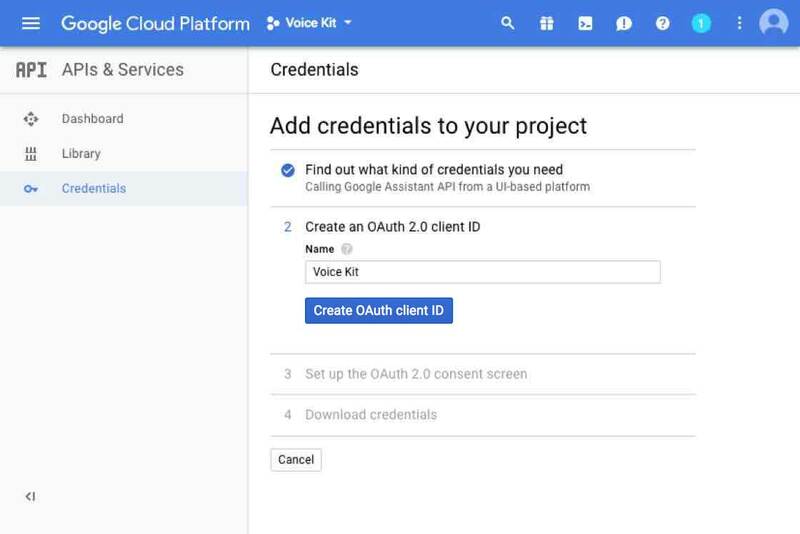 In order to make use of the Google Assistant and Cloud Speech APIs, you need to get credentials from Google's developer console. 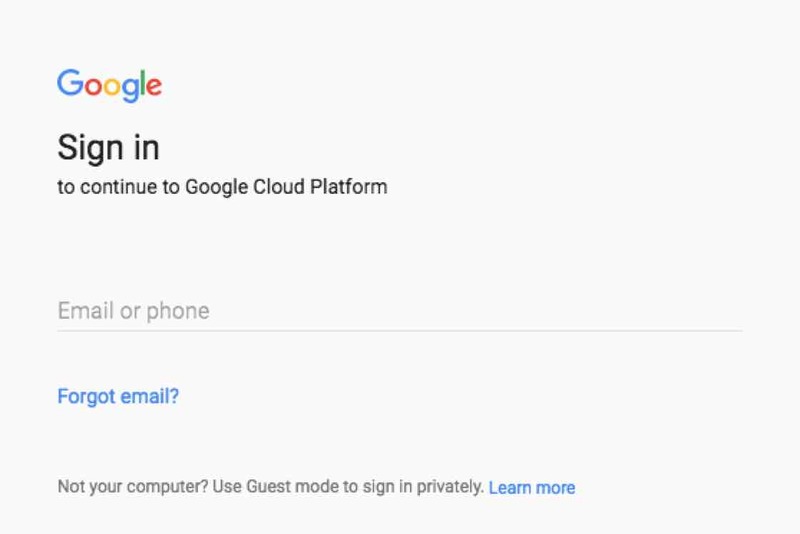 On your computer (not the Raspberry Pi), go to https://console.cloud.google.com/. Don’t have a Google account? Sign up for one here. Read the Terms of Service. If you agree, click Agree and continue. 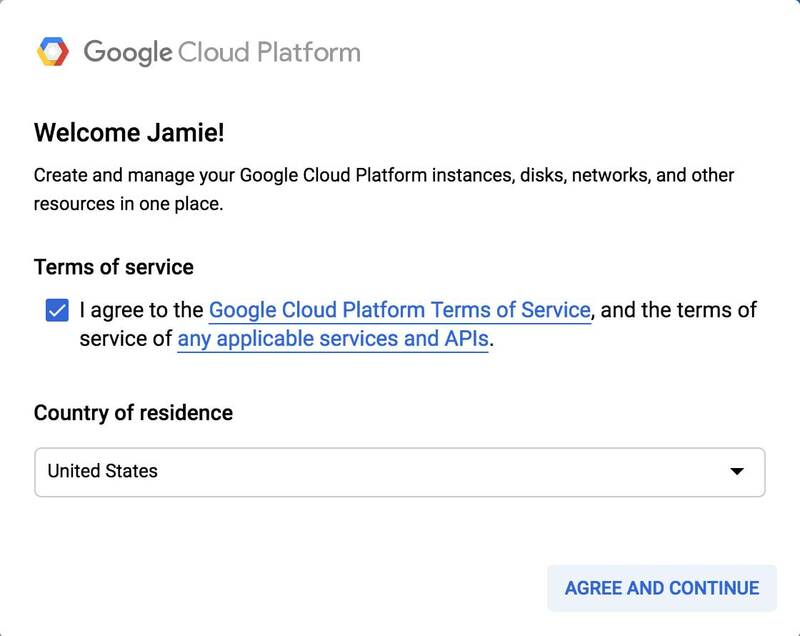 Welcome to the Cloud Platform. 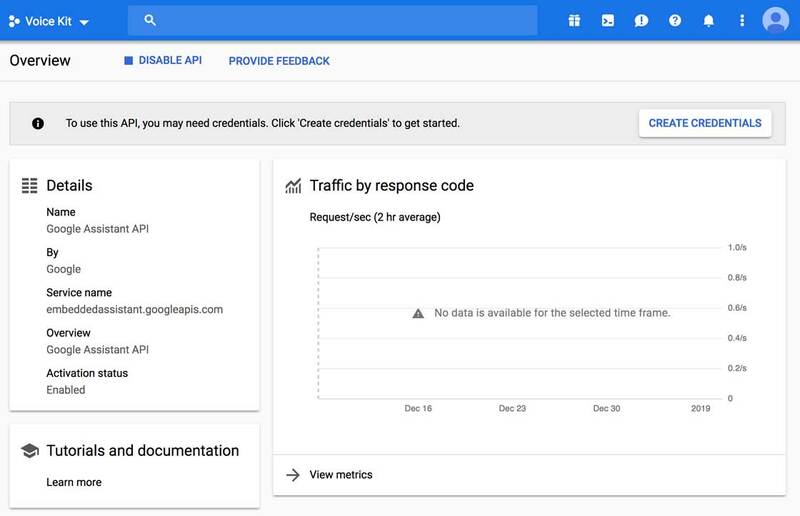 This is the control panel where you can configure your applications to make use of Google's developer APIs. 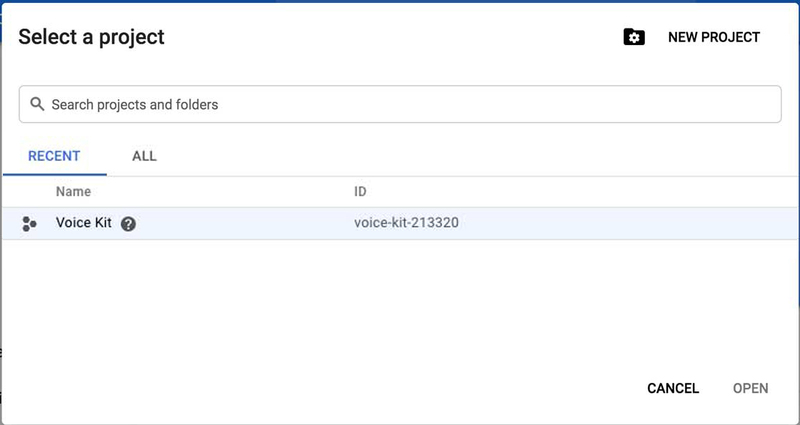 First, we have to create a project to track all of the APIs we want to use on the Voice Kit. From the top bar, click Select a project. A dialog like the image to the left will appear. Click New Project in the top right corner of the dialog. 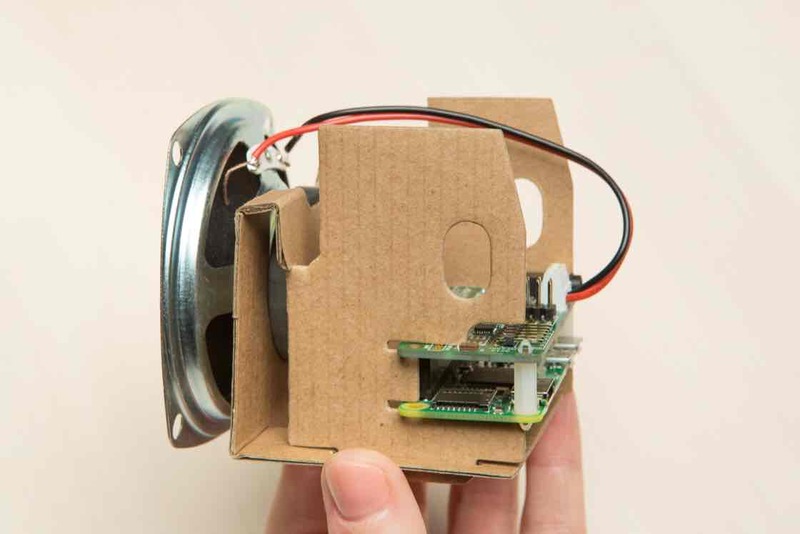 We’ve used "Voice Kit" for a project name, but you can enter any name you like. Now that we've created the project, we need to select it so we can turn on the APIs we want to use. Click the Home link in the left navigation. Then click Select a project at the top of the screen again. Then select the project you just created. This opens the dashboard view for your project (you can tell by the dropdown at the top of the screen; it should display the name you chose in the previous step). 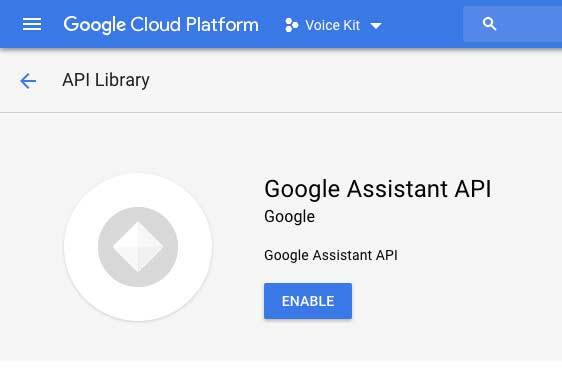 Now we need to turn on the Cloud Speech and Google Assistant APIsAn API is a collection of functions that programs can call to make use of extra functionality. It's kinda like using an ice cream maker; you put things in and get a delicious result back! . If the left navigation is not already visible, click on the three-line menu icon at the top left of the page to open it. Hover your mouse over APIs & Services, and then click Library. 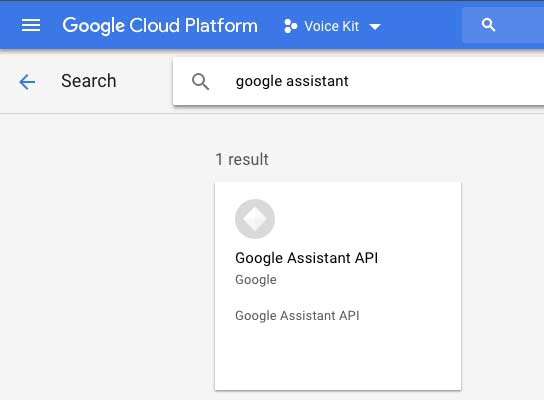 In the search box, type "google assistant" and click on the card labeled Google Assistant API. 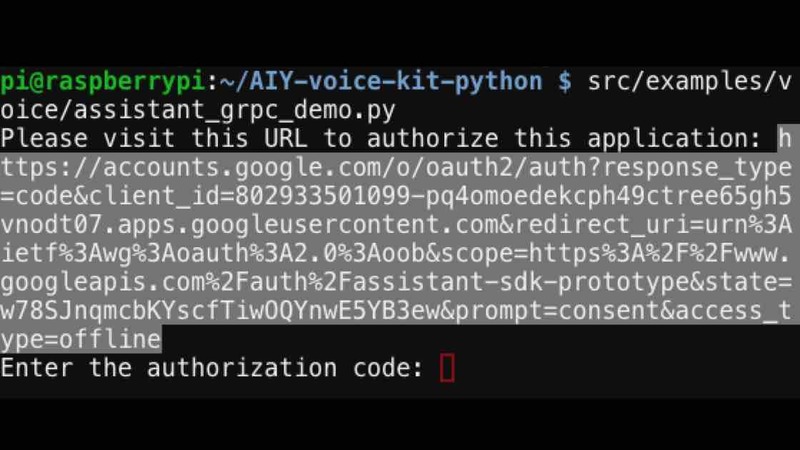 This turns on the Google Assistant API for your project, and gives applications you write access to its features. You'll be directed to a Dashboard page for the Google Assistant API. From here you can get more details on how you're using the API and see how many requests you're making. For now, though, we’ll create a credentials file so that the demos can tell Google who they are, and which project they're a part of. You should be directed to the Credentials helper page. Under "Which API are you using? ", select Google Assistant API. In the "Where will you be calling the API from?" field, select Other UI (e.g. Windows, CLI tool). Finally, under "What data will you be accessing? 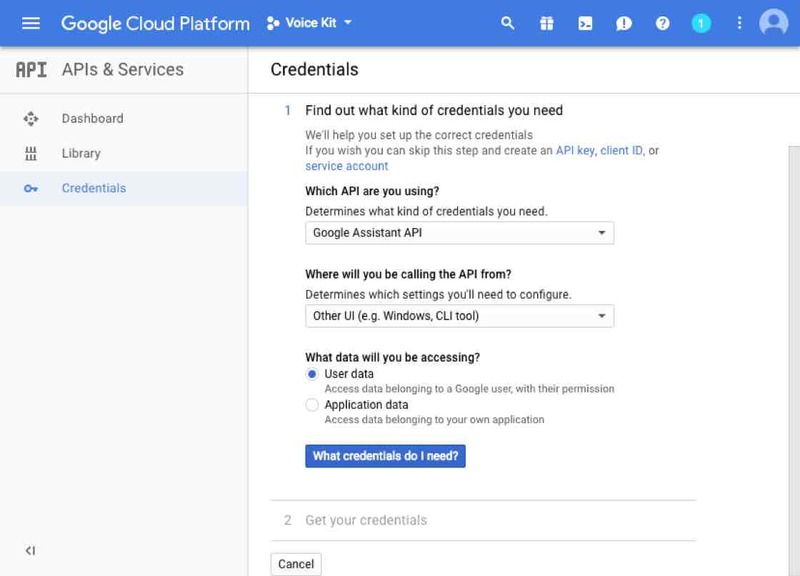 ", choose User dataWe do this because we'll be using the Google Assistant, which requires access to user's data..
Once you've done all that, click the What credentials do I need? button. Enter a client ID. We suggest using the same project name that you used previously. Click the Create OAuth client ID button. Enter your email and a product name shown to users (we suggest something like "Voice Kit Demo"). Click Continue. 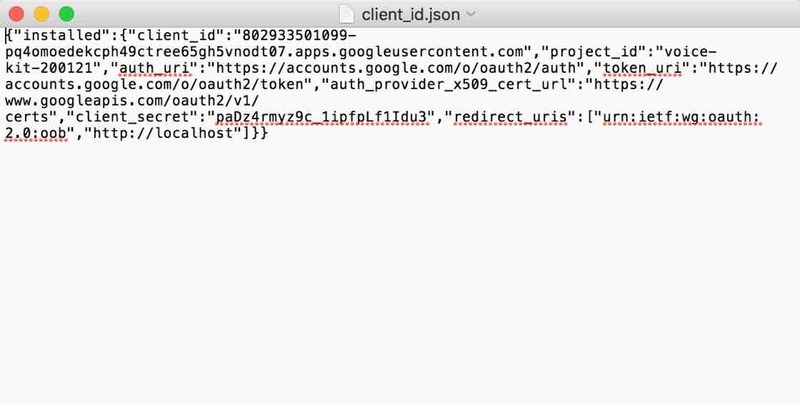 This will generate the credentials in Google's servers and prepare the APIs for use. It might take a few seconds to complete. 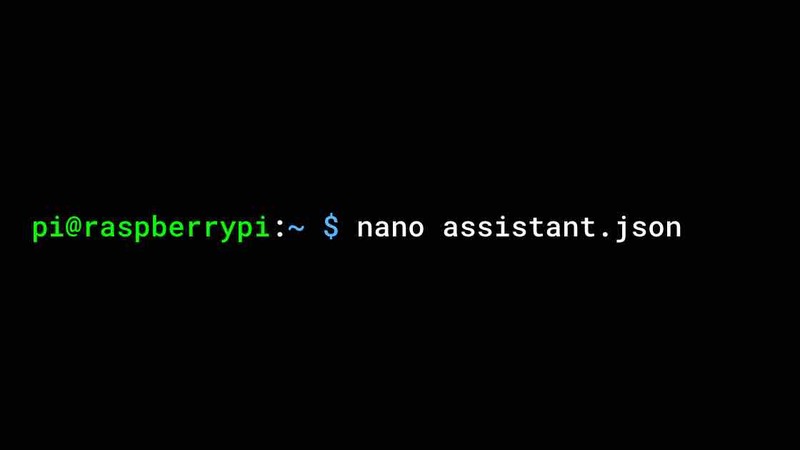 In the following steps, you'll copy this to your Raspberry Pi and save it at ~/assistant.json. 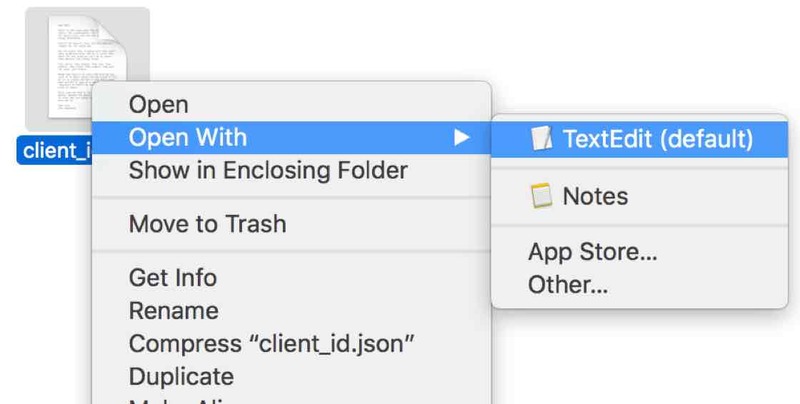 Open your Downloads folder and right-click on the client_id.json file. For Windows: Select Open With > More applications > Notepad. We’re going to copy the text from the text file so that we can paste it into a new file on your Raspberry Pi. 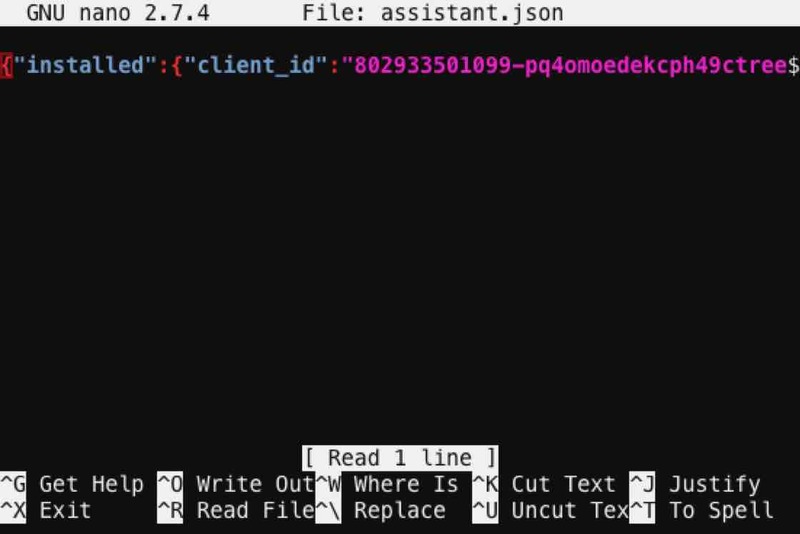 This command starts the nano text editor so we can paste the contents of the JSON file we downloaded earlier into a file on disk. Right-click to paste the text. Note Your client id will be a different number. To save the file, press Ctrl-O (that’s O as in Open, not the number zero). A prompt appears to verify the file name you already specified: assistant.json. Press Enter. Hint: nano has quite a few options you can use to write programs with later. Type Ctrl-G to find out more. Type Ctrl-X to exit. This will bring you back to the shell prompt. Type lsls is shorthand for LiSt and prints out all of the files in the current working directory. It's a great way to look around and see what changed on disk. and press enter. Hint: that’s an “l” as in lemon, not a #1. This shows you all of the files in your current directory. You should see assistant.json here in white. Congrats! Now you have the credentials you need. Now we’re going to try out some demos. Let’s change directories to the folders where the demos live. What’s cd? cd stands for change directory. Think of it as clicking through file folders. You should see the path in the command line in blue. Capitalization matters: it’s cd, not CD. Practice using cd and ls to navigate around! What’s python? Python is a programming language that we use for the majority of our demos and scripts. It's a simple language and is very easy to learn. You can find out more about Python at https://www.python.org/. Now that you've changed directoriesYou might have heard the terms "folder" or "directory" before. They are synonyms for the same thing: a data structure that contains a listing of filenames and the location of their contents on disk. Think of them like a table of contents: each time you run the ls command, you're "list"-ing the contents of one of these directories., type ls and press enter to see what's inside the examples directory. Most of what you'll try in the following steps is in the voice/ directory. 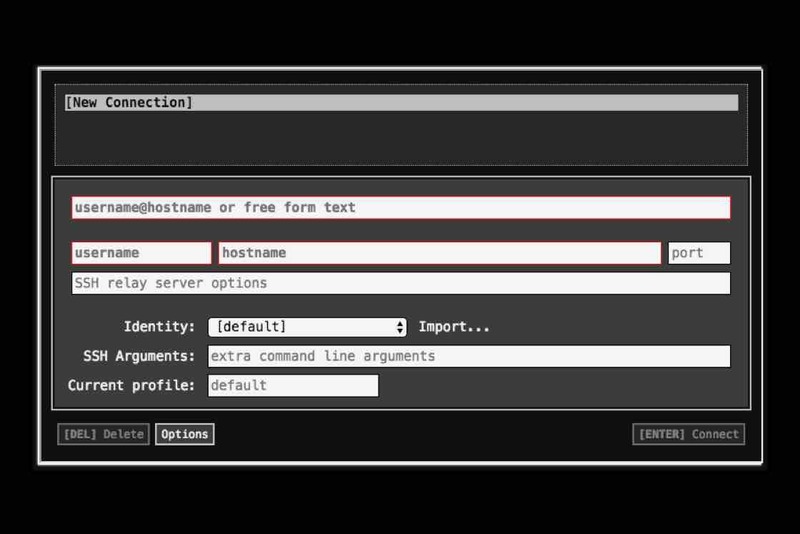 Learn more about working in the terminal Check out some guides from our friends at the Raspberry Pi Foundation: Conquer the Command Line and Linux Commands. Now we’re going to run the assistant demo and try out those APIs we turned on earlier. You’ll see a message about going to a URL to authorize your application. 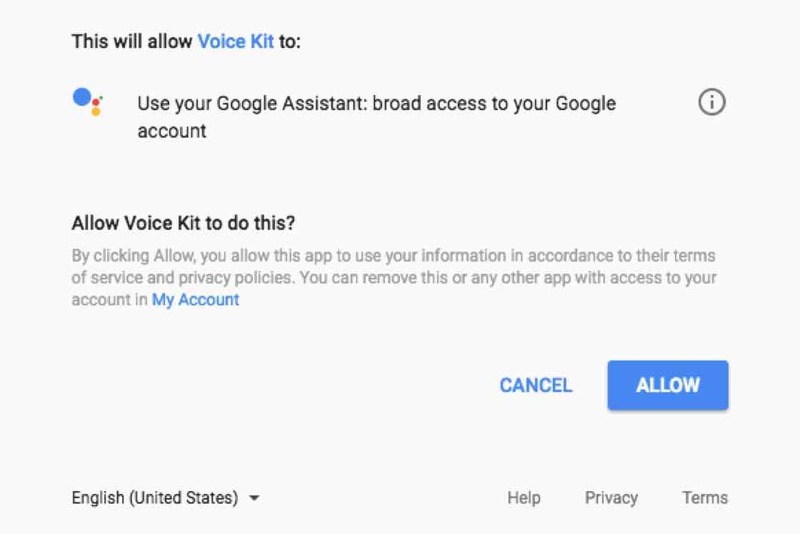 Because this application makes use of the Google Assistant, it needs your permission to safely access your Google account's data. To do this, you have to authorize it by going to the URL it printed out grant access. The web browser should open automatically and load this page. If not, then copy and paste the link you see in the terminal into your browser. Login to your account in the web browser and then click Allow to give your kit access to your Google Account. Once you allow access, you should see the terminal on the Raspbery Pi immediately begin printing more messages now that it has been granted access. You’ll soon see "Press button to start conversation..."
Remember: Press here means a tap of the Voice Kit's button (hold for no more than a second). Tap and release the push button. Then ask a question, or give the Google Assistant a command. 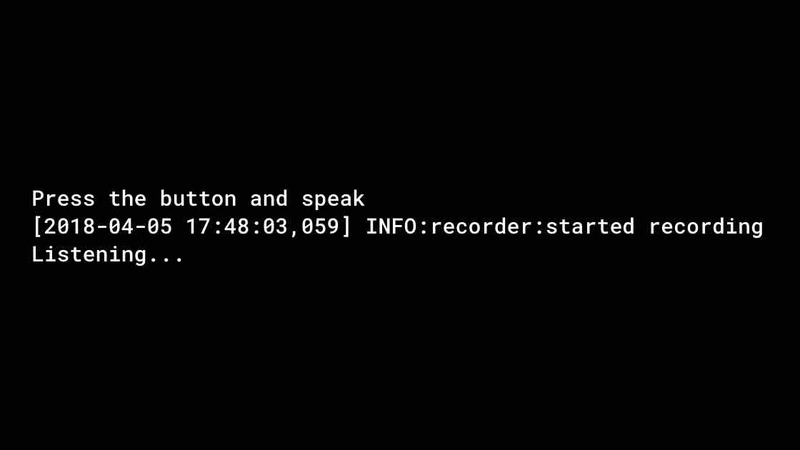 As you speak, you’ll see what the machine learning model is "hearing" as it prints log message in the terminal. Hint It might take a few seconds for the Google Assistant to respond (it’s gotta think). If the Voice Kit is having trouble hearing you, make sure you’re not too close to the device. Try speaking from a little further back. When you’re done testing the demo, press the button and say “Goodbye” or type Ctrl-CWhen Ctrl-C is pressed while in Secure Shell Extension (or in a terminal), will interrupt the command that you previously ran. If you don’t see a prompt, try pressing Ctrl-C a few times, as it's safe to use at the prompt. to interrupt it and stop the demo. If it freezes, type Ctrl-C, and then the ‘up’ arrow for the src line to wake it up again. When you’re done with your Voice Kit for the day, it’s important to shut it down properly to make sure you don’t corrupt the SD card. Once you see the prompt to (R)econnect, (C)hoose another connection, or E(x)it? and the green LED on the Raspberry Pi has turned off, you can unplug the power supply from your kit safely. Remember when you reconnect your power supply to wait until the LED stops blinking before reconnecting your kit via SSH. Important The demo will stop working if you close the Secure Shell Extension or unplug your kit. How did setting up and running the Google Assistant demo go? To reconnect to your kit, plug it back into the power supply and wait for it to boot up (about 4 minutes). Then go ahead and reconnect via SSH. Note: You may have to re-pair your kit via the app. Congrats! 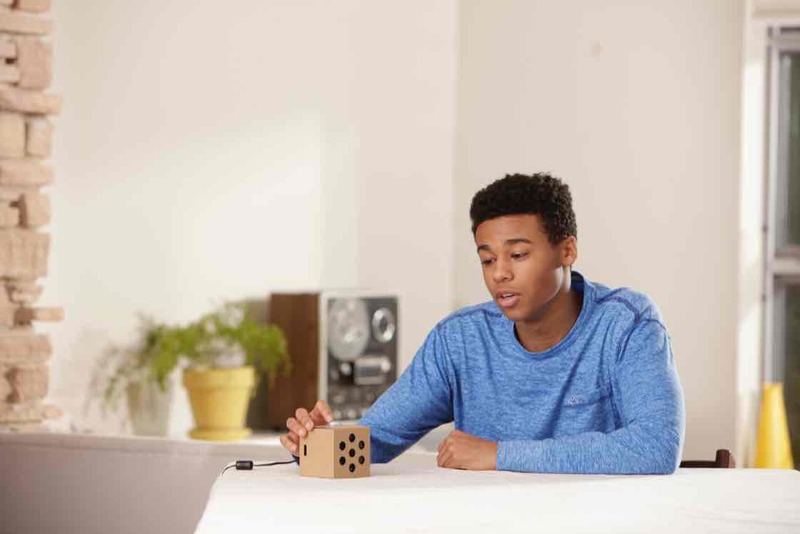 You’ve set up your very own intelligent speaker. Now that you’ve got a taste for the Voice Kit can do, we’d love to see what you do with it. 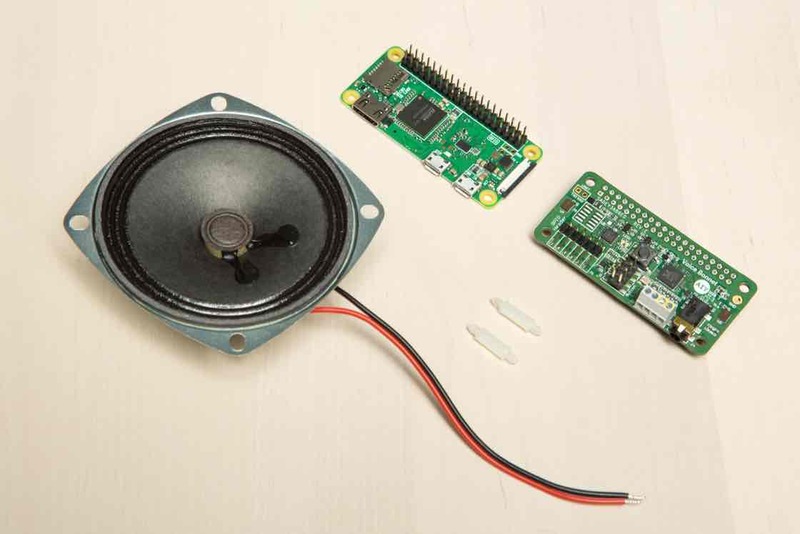 In the following Makers Guide section, you'll find documentation about the Python APIs, hardware, and tools that help you to build your own intelligent speaker projects. Heads up! The next part assumes a much higher level of technical experience. So if you're new to programming, don't be discouraged if this is where you stop for now. 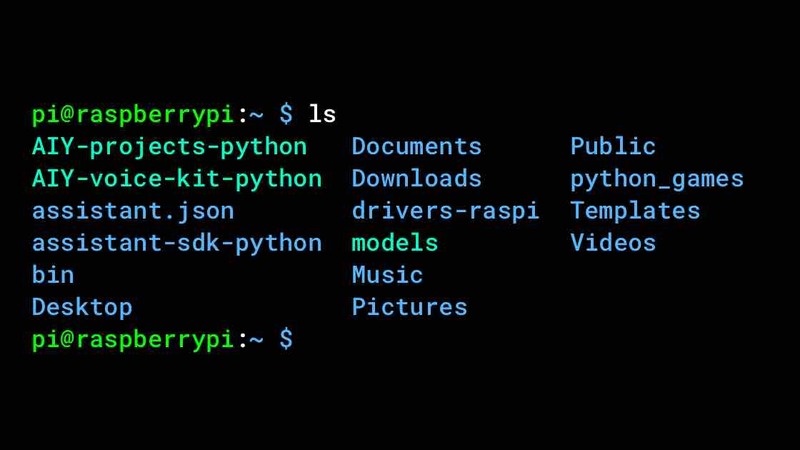 To support various features in the Voice Kit, we've built a Python library that handles a lot of programming dirty work for you. 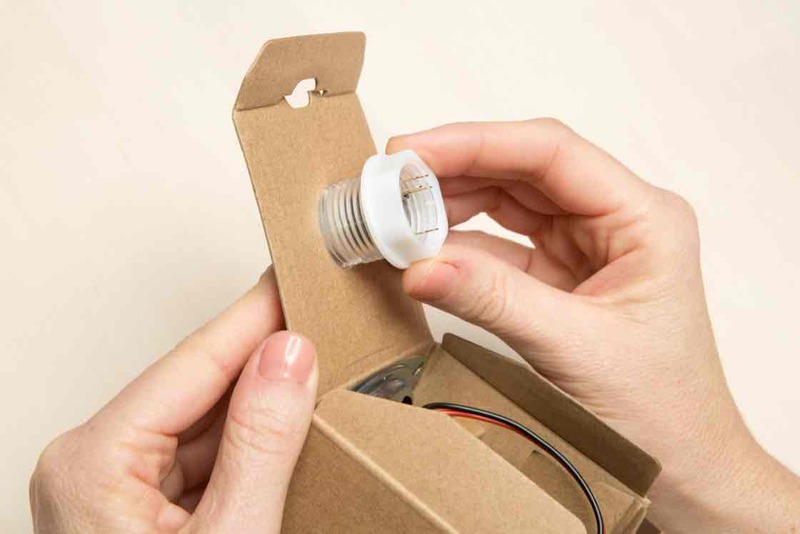 It makes it easy to interact with services like Google Assistant and Cloud Speech-to-Text, and to use kit peripherals such as the button, LEDs, and extra GPIO pins. 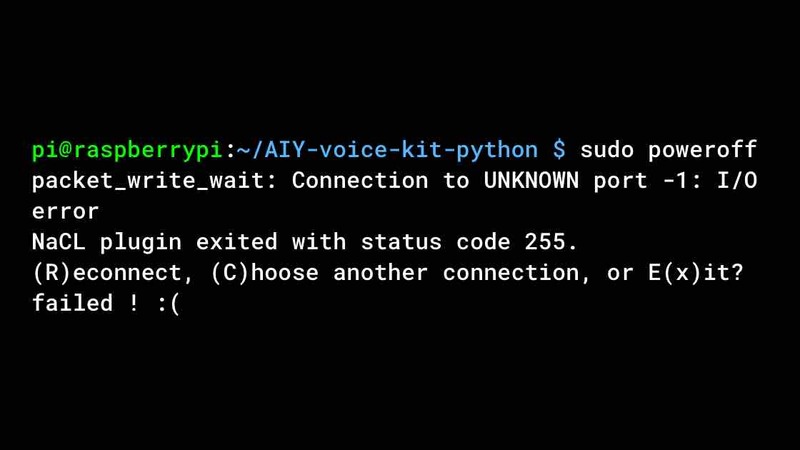 These APIs are built into a Python package named aiy, which is pre-installed in the kit's system image. Just be sure that you've installed the latest system image. 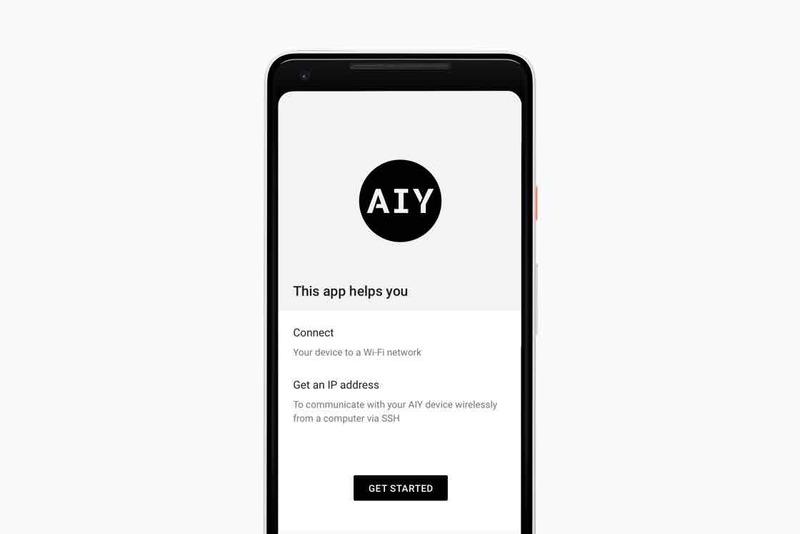 aiy.assistant: APIs that simplify interaction with the Google Assistant API. aiy.cloudspeech: APIs that simplify interaction with the Google Cloud Speech-to-Text service. aiy.voice.tts: An API that performs text-to-speech (reads some text aloud). 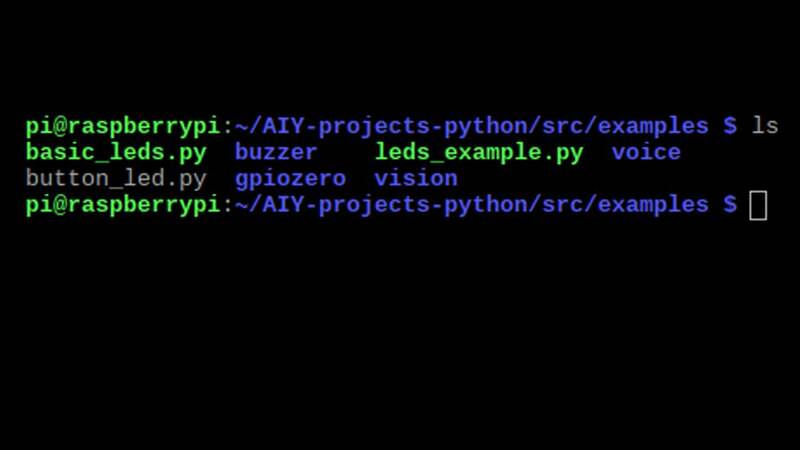 aiy.leds: APIs to control the LEDs in the button. aiy.pins: Pin definitions for the bonnet's extra GPIO pins, for use with gpiozero. 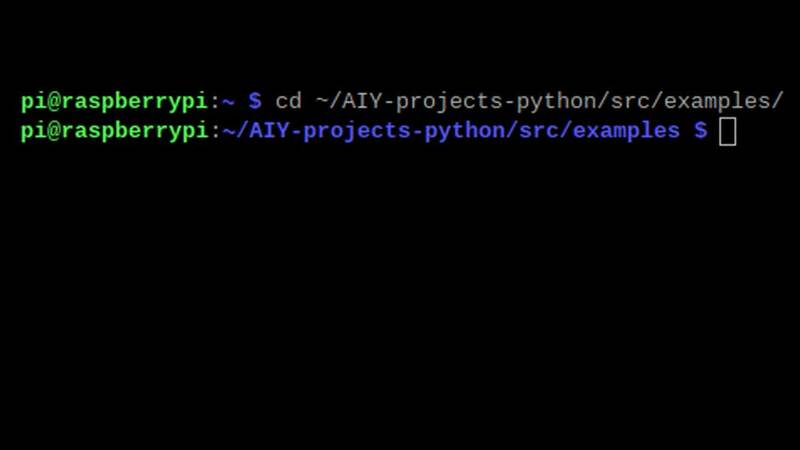 You might find it easier learn the aiy Python API if you start with an existing demo and modify it to do what you want. 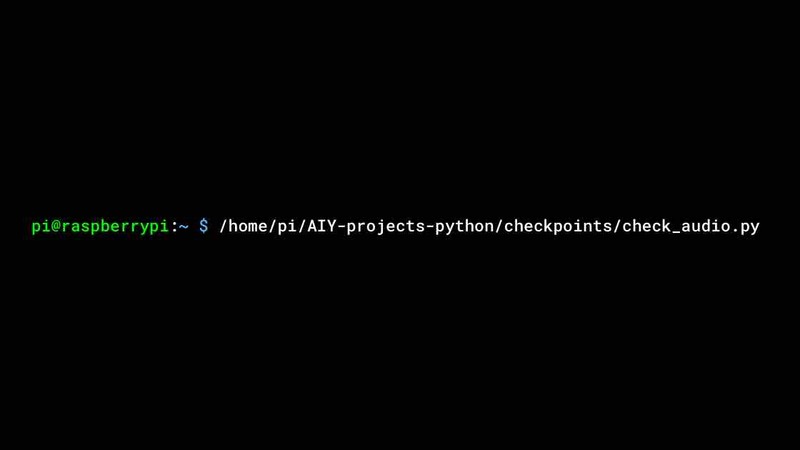 These files are already installed on your kit at ~/AIY-projects-python/src/examples/. You can also browse the examples on GitHub, where you'll find the source code for all the examples and more. This waits for you to push the button, then begins recording what you say. When done speaking, press the button again and it will play the recording. To see how it works, open this file on your Raspberry Pi or see the source code here. Then start tweaking the code. If you're more interested in programming hardware such as buttons and servos, see the section below about the GPIO expansion pins, which includes some other example code. Want to try another API? 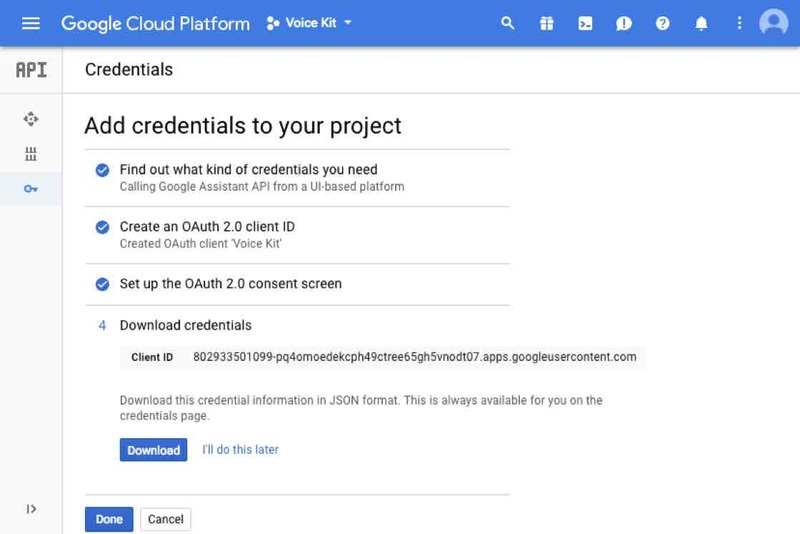 Follow the instructions below to try the Google Cloud Speech-to-Text service, which converts spoken commands into text you can use to trigger actions in your code. This API supports 80 languages, long audio clips, and the ability to add hint phrases that help improve the accuracy of speech recognition. 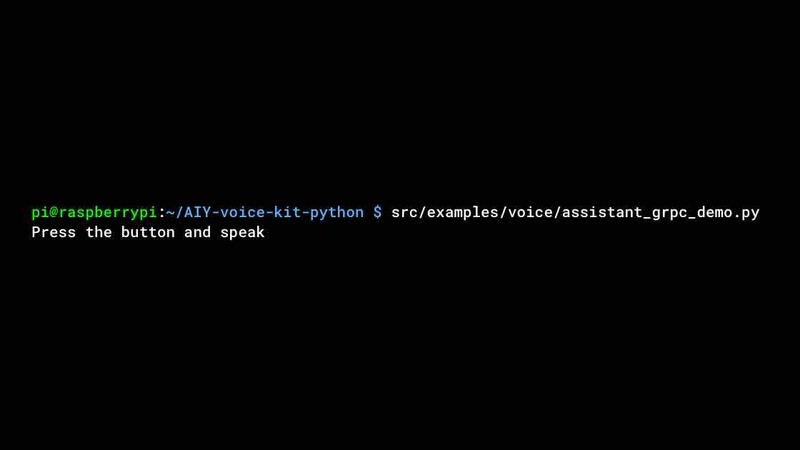 To get started, you'll use the src/examples/voice/cloudspeech_demo.py example code. Why do I need to turn on billing? 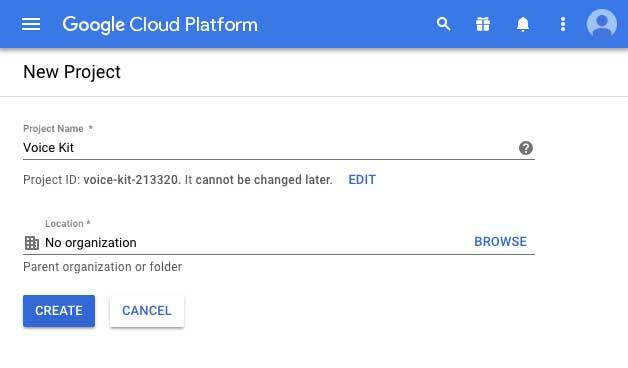 The Google Cloud Speech-to-Text service is a cloud-based service. If you use it for less than 60 minutes a month, it’s free. Beyond that, the cost is $0.006 for every 15 seconds. Don’t worry: you’ll get a reminder if you go over your free limit. Return to the main billing page, then click the My projects tab. Find the name of your new project. Make sure it’s connected to a billing account. If you see an error message, follow the details and try the Check Cloud script again. 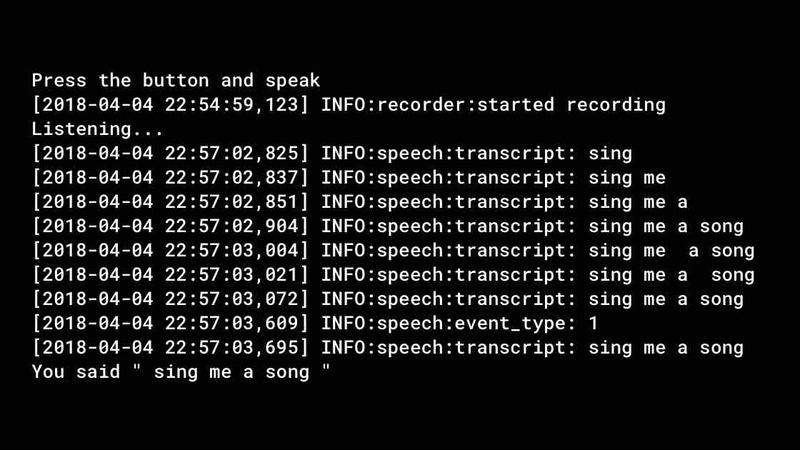 Once the program starts, it prints some log messages, including INFO:aiy.cloudspeech:Start listening which means it's ready to receive a voice command. So now you can speak one of the following commands (speak loudly and clearly toward the Voice Kit). 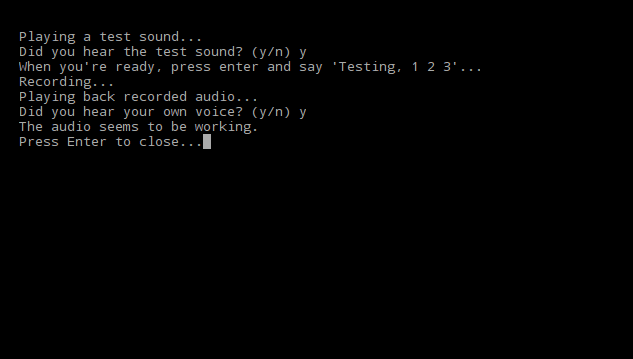 Now you can add your own voice actions by modifying cloudspeech_demo.py as follows. Let's add the ability for the program to repeat what you say. That is, if you say something like, "repeat after me, hello world," then it will say "hello world." Return to your terminal window and run the code again. Wait until the terminal prints INFO:aiy.cloudspeech:Start listening and then try saying "repeat after me, hello world." The result should be that the speaker says "hello world." 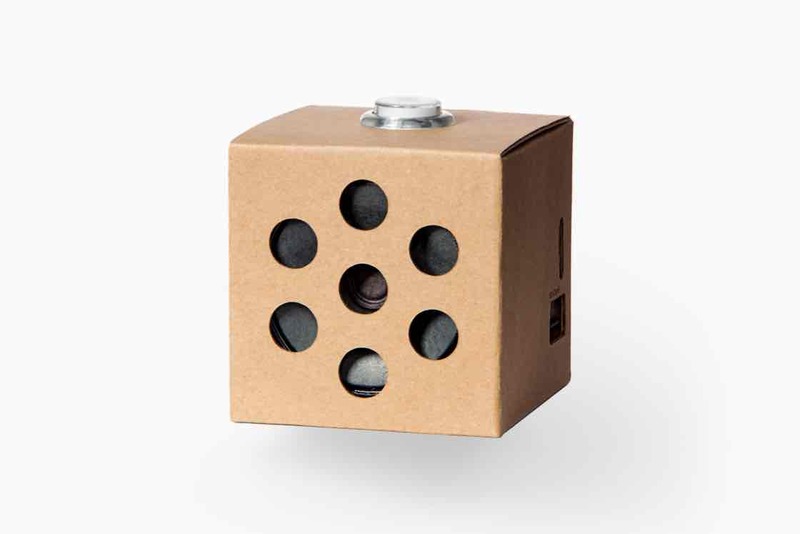 Help your fellow makers experiment with on-device TensorFlow models by donating short speech recordings. This small web app will collect short snippets of speech, and upload them to cloud storage. We'll then use these recordings to train machine learning models that will eventually be able to run on-device, no Cloud needed. 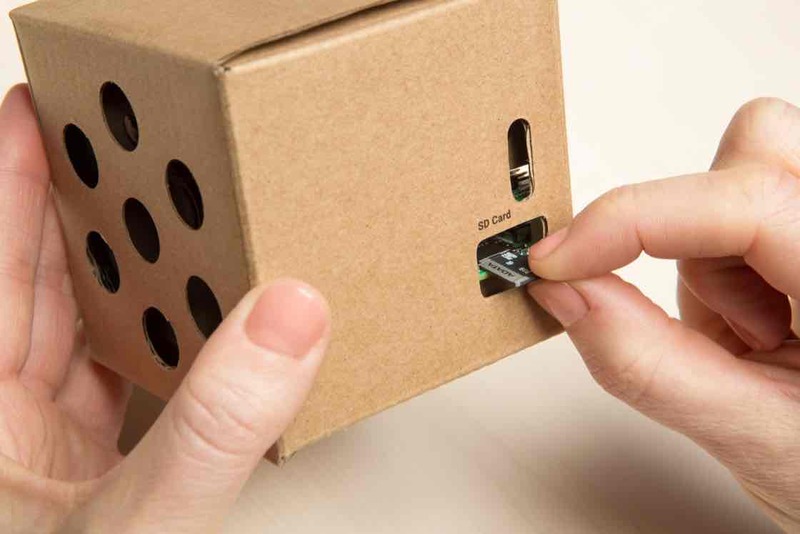 If you plan to take your project beyond the cardboard box, you might be wondering which GPIO pins are available for your other hardware. 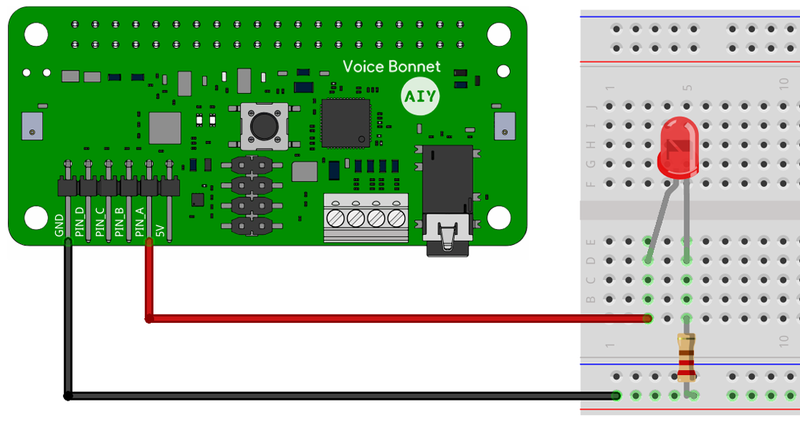 So figure 1 shows exactly which pins from the Raspberry Pi are used by the Voice Bonnet. The extra GPIO pins are provided on the top of the Voice Bonnet (see figure 2). You can control the GPIOs and LEDs with the gpiozero library, using pin names PIN_A, PIN_B, PIN_C, PIN_D, LED_1, and LED_2. The gpiozero-compatible pin definitions are provided by the aiy.pins package. You can use these definitions to construct standard gpiozero devices like LEDs, Servos, and Buttons. 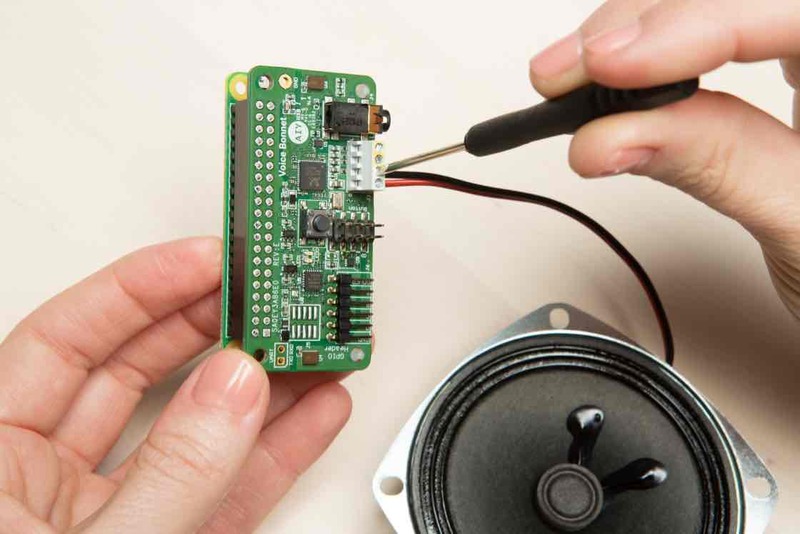 WARNING: Before you connect any wires to the Voice Bonnet, be sure your Raspberry Pi is disconnected from any power source. Failure to do so could result in electric shock, serious injury, death, fire or damage to your board or connected components and equipment. Note: The following example code might not be installed on your SD card right out of the box. Be sure that you are running the latest system image. It takes several seconds for the script to begin. Once it does, your light will blink on and off. To stop, press Control+C. If the light does not blink, continue to wait another 15 seconds. If it still does not blink, look for any errors in the terminal window. Then press Control+C to stop the script, power off the kit, and double check all wiring. Then try again. Of course, the code works fine with just one LED connected. But once you have the one LED working, try connecting LEDs to PIN_B, PIN_C, and PIN_D in the same way, and run the code again. Because the GPIO pins on the Voice Bonnet are controlled by an on-board MCU, they perform pulse-width modulation (PWM) more precisely than the Raspberry Pi. So these pins are great for controlling servos. It takes several seconds for the script to begin. 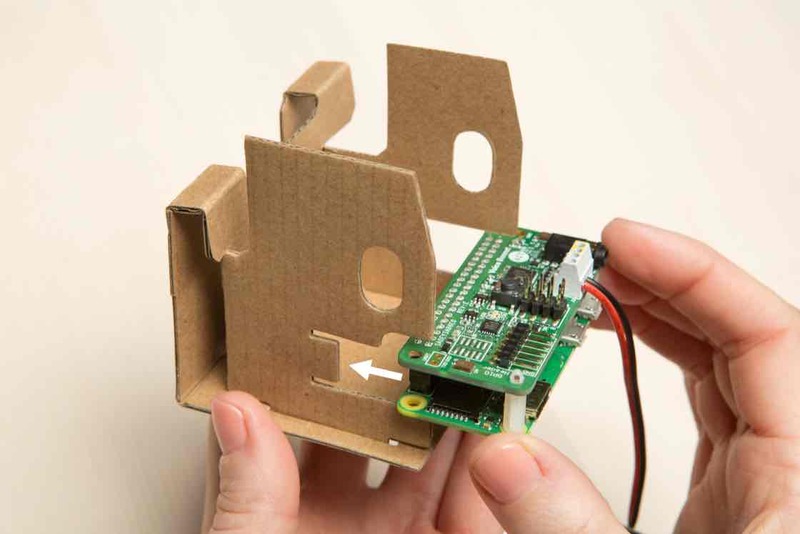 Once it does, your servo should rotate back and forth between the minimum, maximum, and neutral position. But each servo can be a little different, so you might need to tune the parameters of the code to achieve a perfect alignment with your servo's full range of motion. 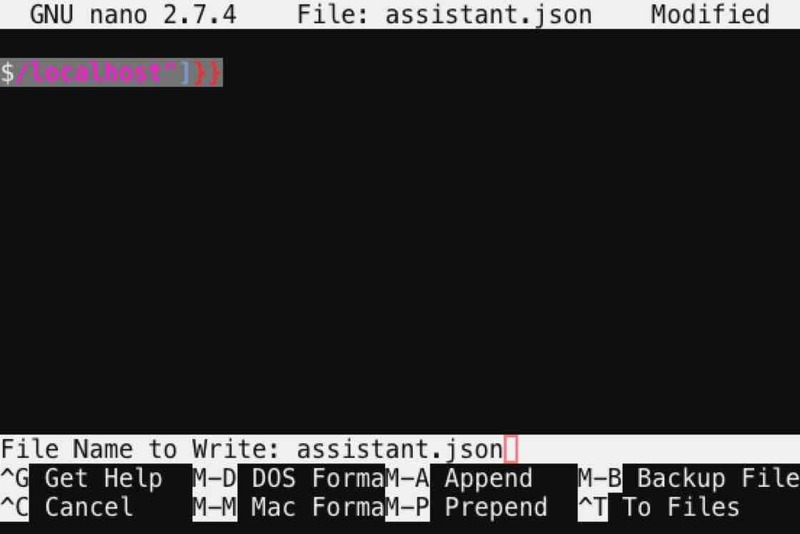 If the terminal prints an error that ends with gpiozero.exc.GPIOPinInUse: Pin already in use, then type sudo !! and press Enter (this is a shortcut to repeat the last command with sudo). If the servo does not respond, continue to wait another 15 seconds. If it still does nothing, look for any errors in the terminal window. Then press Control+C to stop the script, power off the kit, and double check all wiring. Then try again. # Create a servo with the custom values to give the full dynamic range. # Move the Servos back and forth until the user terminates the example. To adjust the rotation range of your servo, open the Python script and adjust the parameters of the Servo() constructor. Also see the Servo API documentation. For more examples using the GPIO pins, see the AIY GitHub examples. All of these example files are already available on your Voice Kit in the direcory ~/AIY-projects-python/src/examples/. Just be sure you have the latest system image on your SD card. 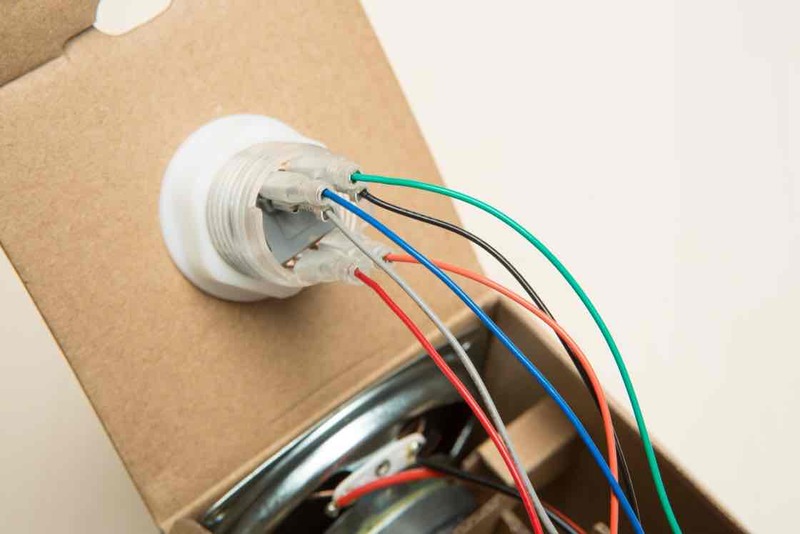 If you want to modify the button interface (such as to change the actual button), be sure to follow the wiring pinout as shown in figure 5. 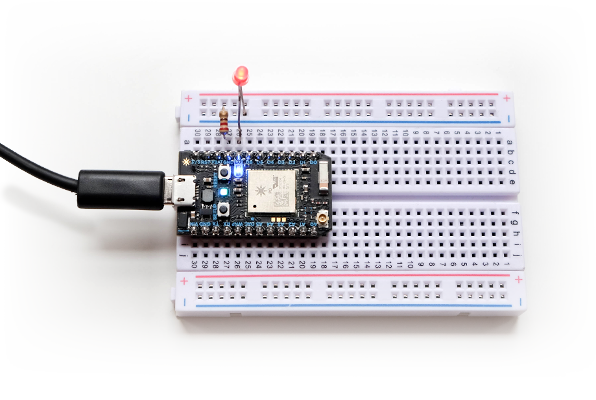 Want to learn how to use your Voice Kit to control other IoT devices? 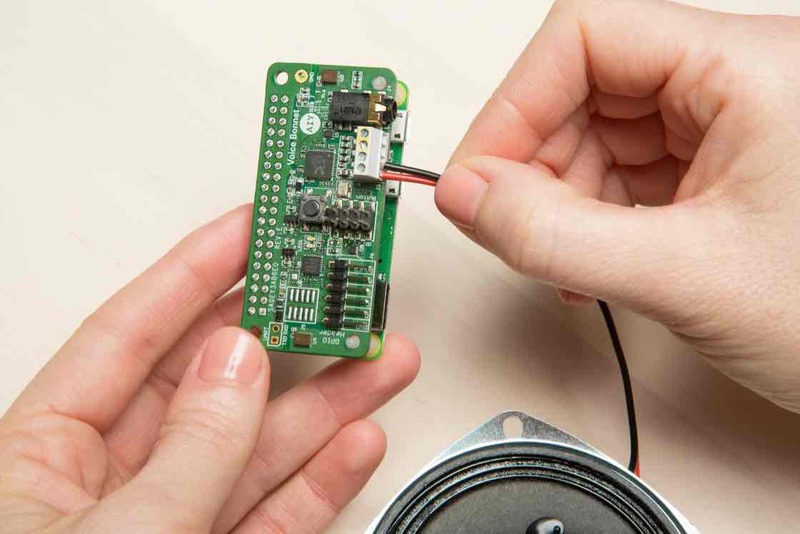 You can start here with a Particle Photon (a Wi-Fi development kit for IoT projects) and Dialogflow (a tool for creating conversational interfaces). 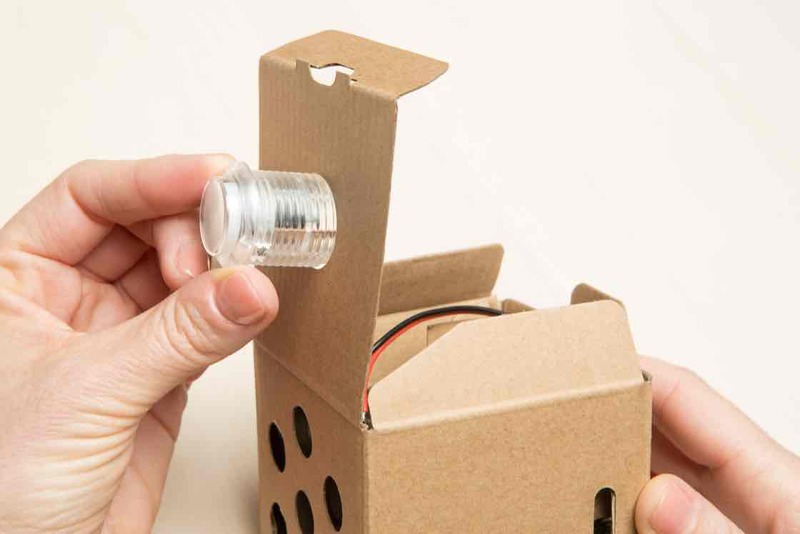 This tutorial will show how to make your Voice Kit communicate with Dialogflow (and Actions on Google) to control an LED light with the Photon by voice. Get all the code for this example here. This should be enough to get you started and on to building great things! It's handy to have a breadboard, some hookup wire, and a bright LED, and the examples will show those in action. However, the Photon has an addressable LED built in, so you can use just the Photon itself to test all the code presented here if you prefer. If you're just starting out, or if you're already comfortable with a microservices approach, you can use the 1-firebase-functions example — it's easy to configure and requires no other infrastructure setup. If you'd prefer to run it on a full server environment, or if you plan to build out a larger application from this, use the 2-app-engine example (which can also run on any other server of your choosing). If you've got all those (or similar services/devices) good to go, then we're ready to start! Assuming you have all the required devices and accounts as noted above, the first thing you'll want to do is to set up apps on the corresponding services so you can get your devices talking to each other. First, you'll need to clone this repo, and cd into the newly-created directory. Once you‘ve taken a look, we’ll move on! Using the Dialogflow account referenced above, you‘ll want to create a Dialogflow agent. We'll be setting up a webhook to handle our triggers and send web requests to the Particle API. You've now imported the basic app shell — take a look at the new ledControl intent (viewable from the Intents tab). You can have a look there now if you're curious, or continue on to fill out the app's details. Head over to the Integrations tab, and click Google Assistant. Go back to the General tab (in Settings), and scroll down to the Google Project details. 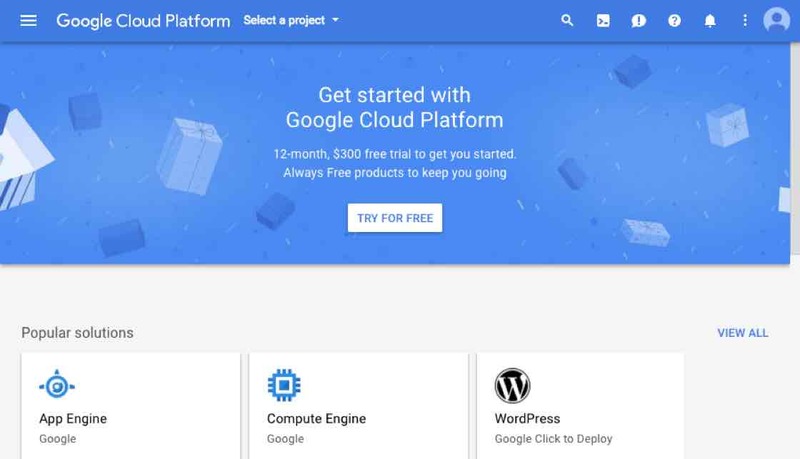 Click on the Google Cloud link and check out the project that's been created for you. Feel free to customize this however you like. You can also try talking to your application on any Assistant-enabled device that you‘re signed into. However, if you’re following along step-by-step, it won't turn any lights on yet — we still have to set up the web service and the Photon app. Onward then! Depending on which hosting environment you want to use, cd into either ./dialogflow-webhook/1-firebase-functions or ./dialogflow-webhook/2-app-engine, and continue the setup instructions in that directory's README.md file. 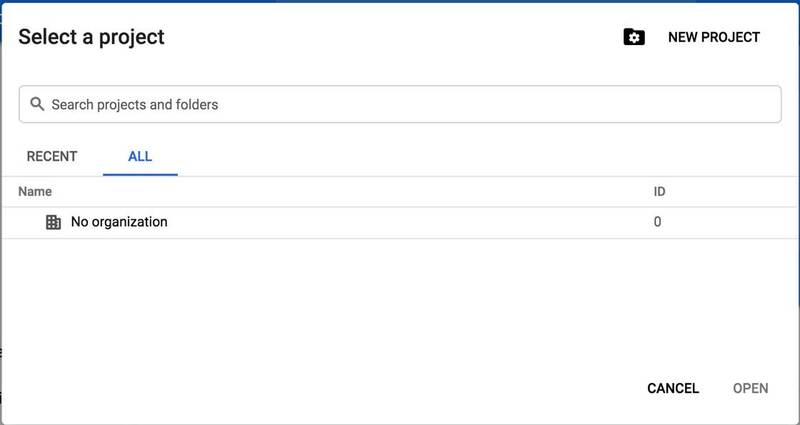 IMPORTANT: Regardless of what hosting/deployment method you choose, make sure you return to the Dialogflow panel and go into the Fulfillment tab to update the URL field. Also, check that the DOMAINS field is set to "Enable webhook for all domains". Without doing these things, Dialogflow won't be able to talk to your new webhook. You can upload your code to your photon via the Particle web editor, the Particle Desktop IDE (based on Atom), or the Particle command-line tools. The Photon should blink rapidly while the upload is in process, and when it's done (and calmly pulsing cyan), you're ready to go. Note: Make sure you generate a Particle access token, and add that token (along with your Photon's device id) to your config.js file. You should see the Photon's light come on (along with an LED on the breadboard, if you've wired one up)! Doing the same with led=off will return a 0 instead of a 1, and will (you guessed it) turn the light off. Note: If you ever see a "return_value":-1, that's an error message — something has gone wrong somewhere. Once you’ve uploaded all the code and each service is configured, it’s time to give it all a try! You can confirm that everything went to plan by going to either your Assistant-enabled device or the Google Actions simulator, asking to talk to your app ("talk to [APP-NAME]"), and typing "turn the light on". If all goes well, your LED should turn on! By default, your Voice Kit doesn't do anything when it boots up; you must manually execute a program such as the Assistant Demo. But you can make this program (or any other program of your choice) run automatically upon bootup by creating a systemd service. All set! You can try rebooting now to see it work. Note: Even after the prompt returns from this command, it takes a few moments for the program to start. When the Assistant Demo is ready, the button lights up. Now to create a similar service for your own program, just copy the configuration from above to a new file such as my_program.service (the name must end with .service). Then (for most programs) all you need to do is change ExecStart so it points to your program's Python file (and passes it any necessary parameters), and change Description to describe your program. Then follow the steps above using your service name instead. If you'd like to better understand the service configuration file, see the .service config manual. If you need to see more logs to help with debugging (or you're simply curious to see more output), you can view system logs and program-specific logs using the journalctl tool. By default, this prints a lot of system information that won't be useful to you, so it's best if you launch your program as a service and then tell journalctl to print only the logs from that service. The -f option continuously prints new log entries as they occur. To stop printing the log, press Control+C. Android Things is Google's managed operating system (OS) for internet-of-things (IOT) devices. It's a powerful OS that helps you build connected devices on a variety of embedded hardware systems. 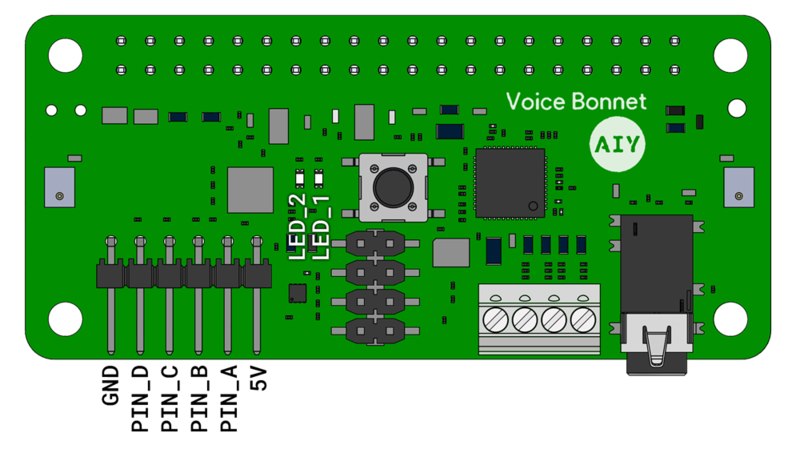 Android Things does not support the Raspberry Pi Zero that's included in the V2 Voice Kit, but it does support the AIY Voice Bonnet when connected to a Raspberry Pi 3. So if you also have a Raspberry Pi 3, follow this codelab to build a voice assistant on Android Things, or download the sample code on GitHub. When flashing is done, put the MicroSD card back in your kit and you're good to go! You did it! Whether this was your first hackable project or you’re a seasoned maker, we hope this project has sparked new ideas for you. Keep tinkering, there’s more to come.